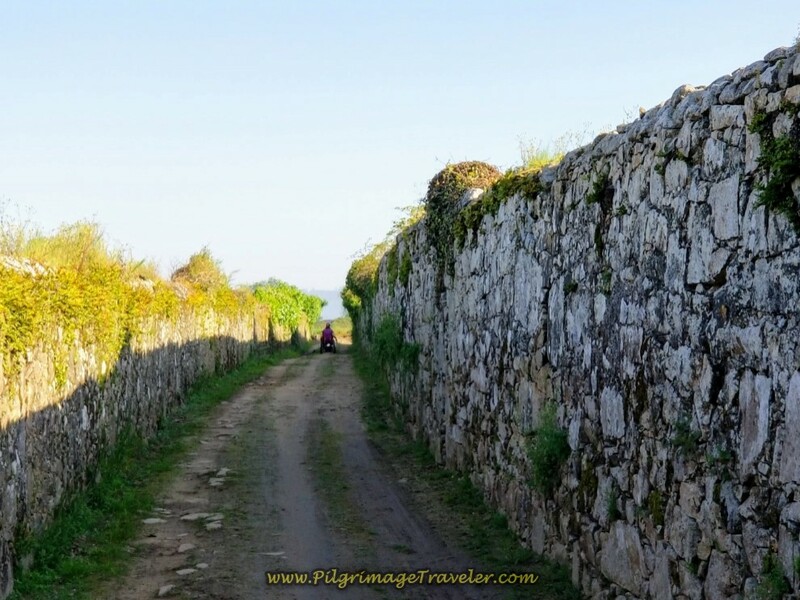 Day sixteen on the Central Route of the Camino Portugués was a day full of surprises. We continued to gather strong and capable men to help us fulfill our purpose. Rich and I have always attracted people who need help, and I have learned to no longer ask "Why?" but to smile and think, "Bring it on God!" when I see it unfold once again. But this time we were not asked to do it alone. I call this the Circle of Love. 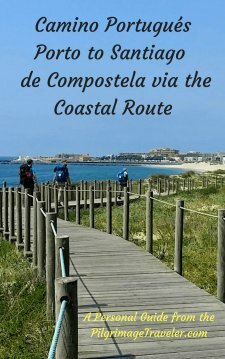 This was to be our recurrent theme on our Camino de Santiago, in the days ahead. Here is our map with our GPS tracks, and important albergues/hotels/cafés along the way, both ones we visited and ones we did not. 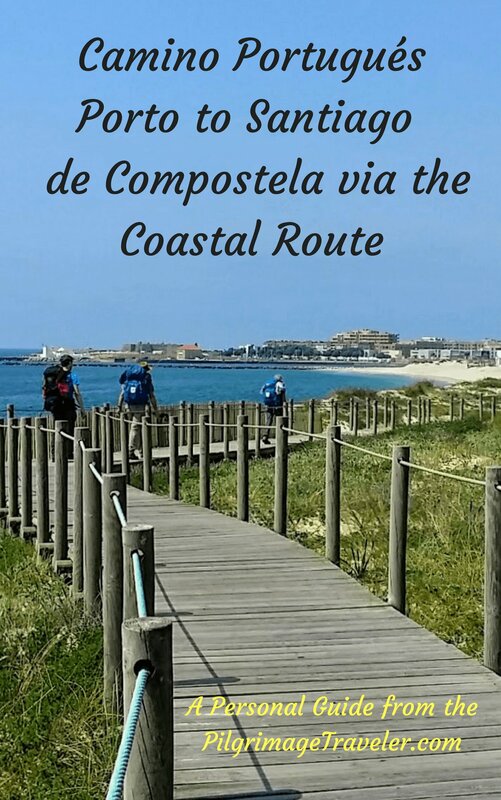 Remember that the Via Lusitania has a complete list of albergues and hostels for the Central Route, so click here to make yourself a copy. I will also include them in my maps. 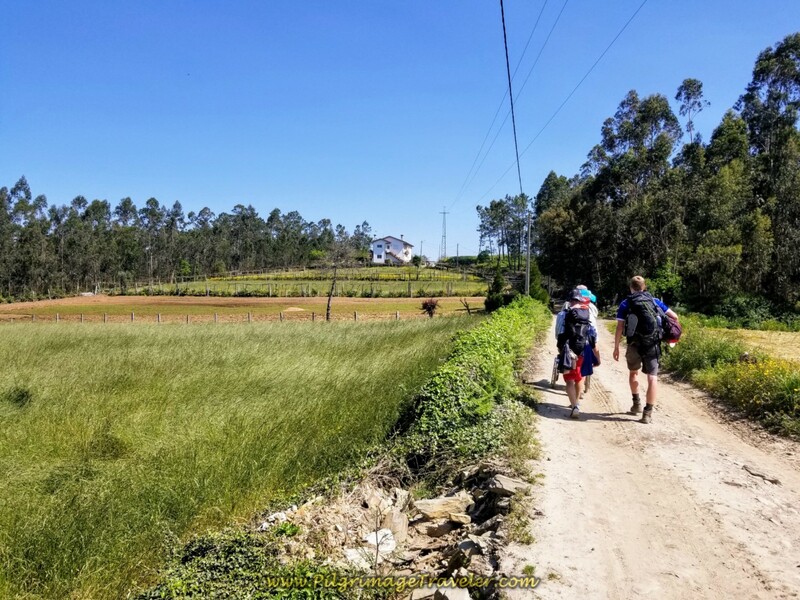 As you can see from our elevation profile of the day, there is a cumulative elevation gain of about 550 meters (1800), and an equal amount of loss, mostly in the final kilometers into Barcelos. With almost 29 km to walk, this will take some energy and frequent breaks. 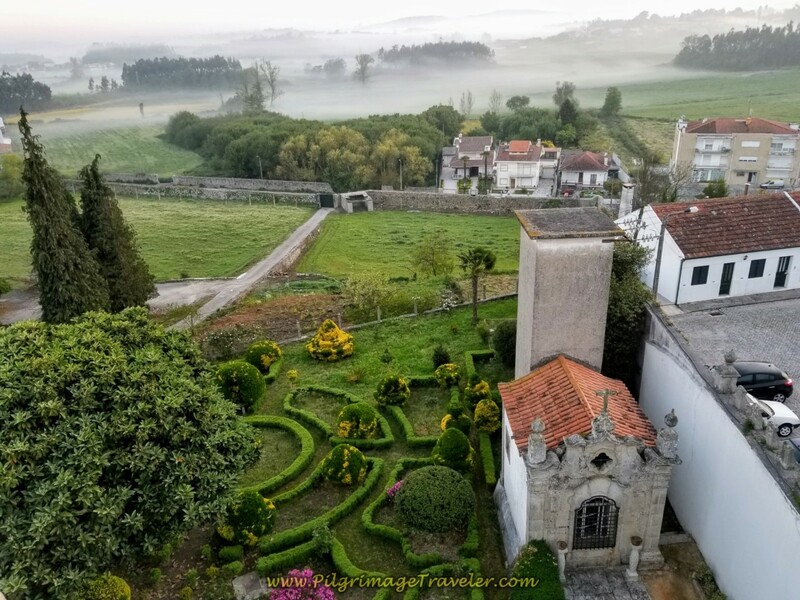 We woke up to a misty morning, and the view from our window in the albergue was stunning! I hoped it would be a nice omen for the day! 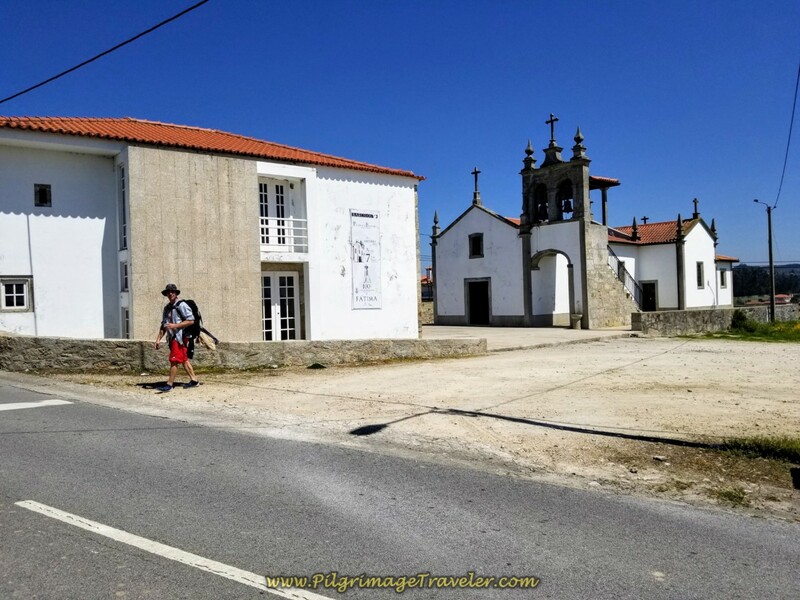 I can't tell you how much we enjoyed our stay at the Albergue de Peregrinos do Mosteiro de Vairão. The evening before, on day fifteen, Matt had informed us of his desire to set off with us in the morning. As always, we were happy to have the company. Magnus chose to sleep in, and we knew he would easily catch up to us along the way. Here we are, setting off from the albergue in the low morning light. It was already a gorgeous day and the mist already clearing. 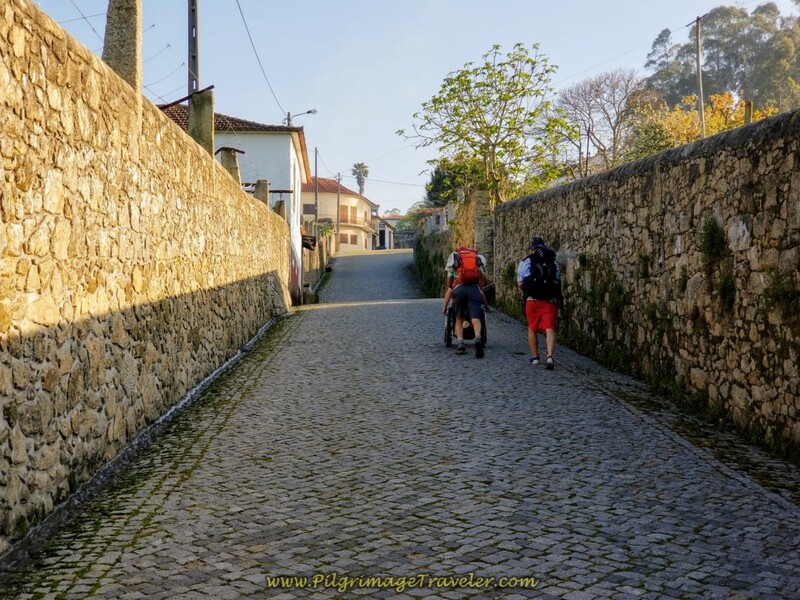 The cobblestone road diverts to a nice path through the forest before dropping the pilgrim right into the town street of Vilarinho, below, in only 1.3 km from the Monastery. 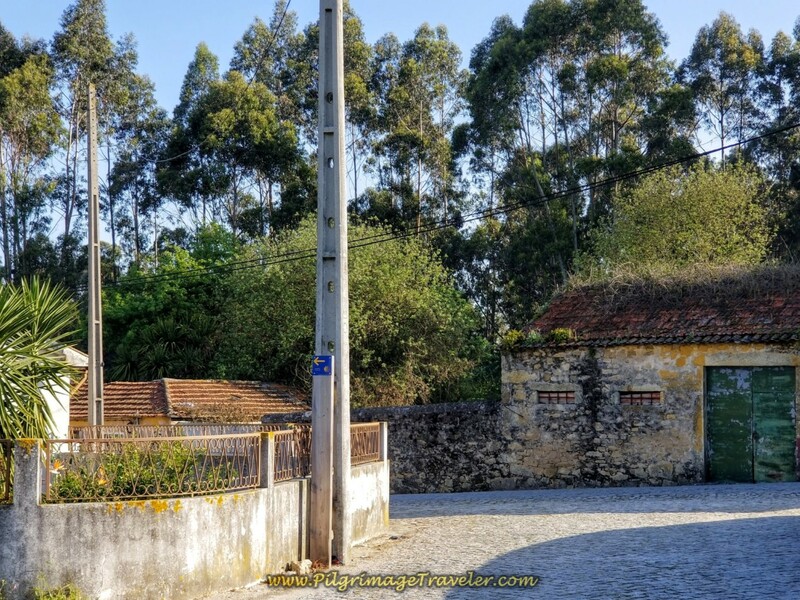 Almost immediately upon entering Vilarinho, you will see the sign directing you to the Casa Familia Vidal Vilarinho. 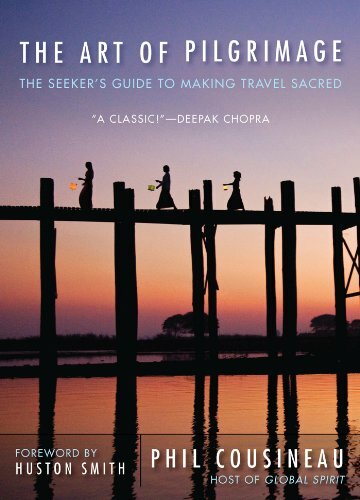 (See our Google map above) It is easy to find if your pilgrimage takes you there for the night. 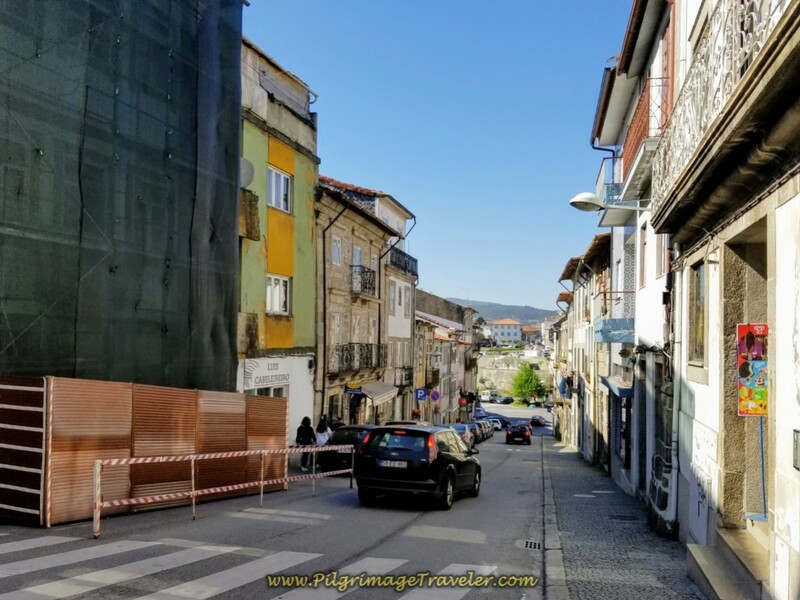 Vilarinho is a small place and we quickly walked through town. By 2 kilometers, we were on the north side, leaving town on the busy N306, shown below. 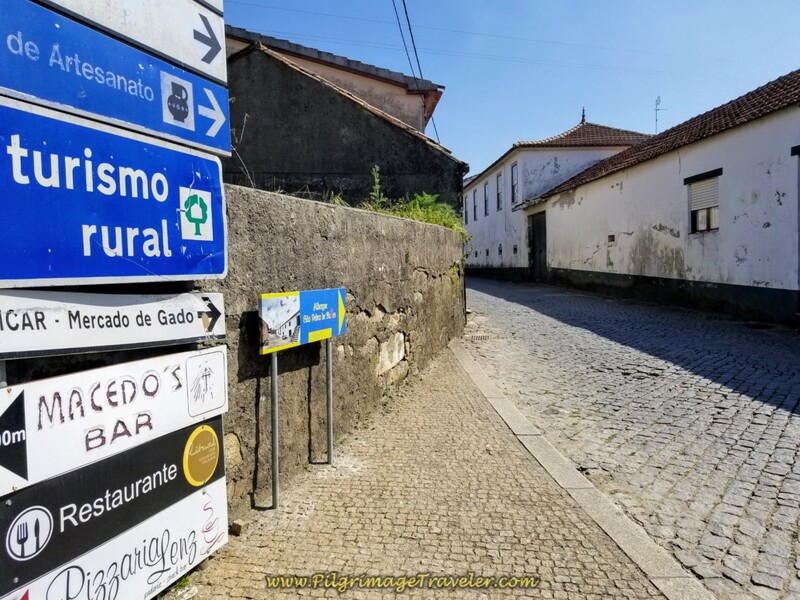 There is a café in the center of Vilarinho if needed, the Café Capri, on the other side of the gas station seen from the Camino in the center of town. It may open early, but ask at your accommodation first. We had bought groceries for our breakfast, so we were all set for the day. 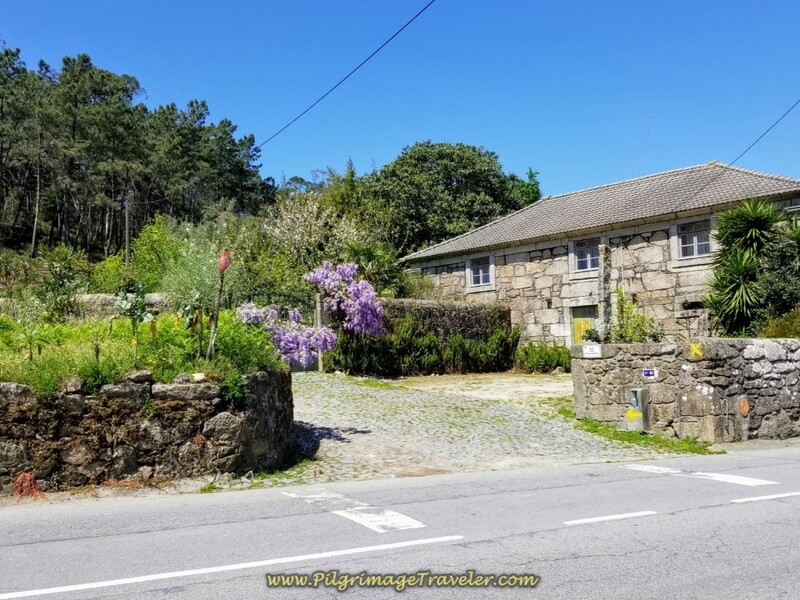 The Casa da Laura is also easy to spot from the Camino, on the N306 as you are leaving town to the north. 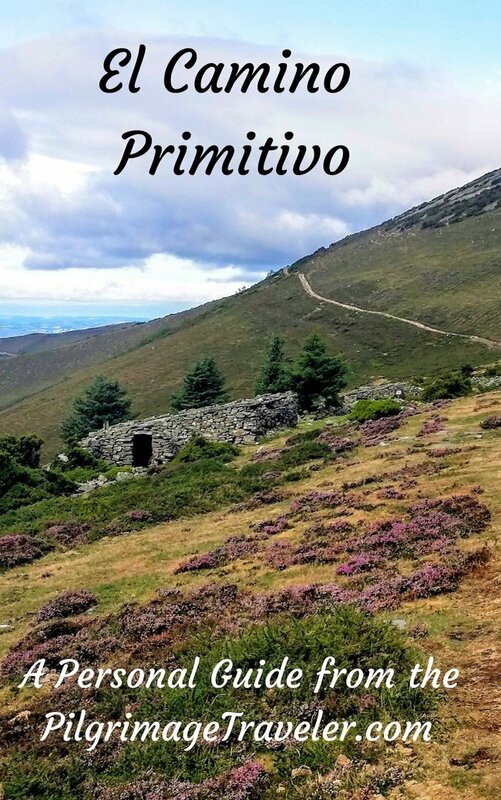 The Camino walks along the N306 for a bit over a kilometer, and along the way you come to a decision point, shown in the distance in the photo below, and up close in the next photo. If you look closely in the photo below, you will see someone waiting at the decision point. Can it be that this person is in a wheelchair? WOW! 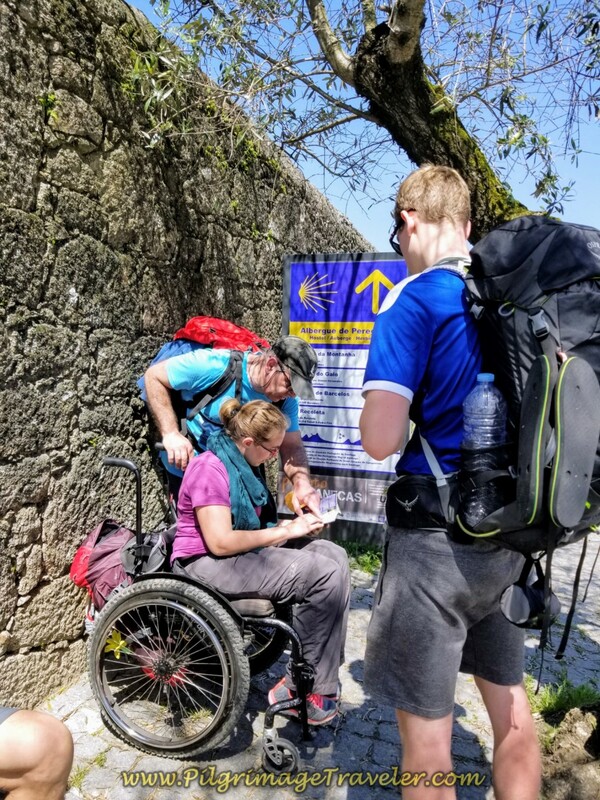 The young woman in the wheelchair was checking her guidebook to see which way she should go. We quickly reached the decision point, and I, being a nurse with lots of physical rehabilitation experience, introduced myself and started chatting with her. I asked her if I could be of assistance to her. 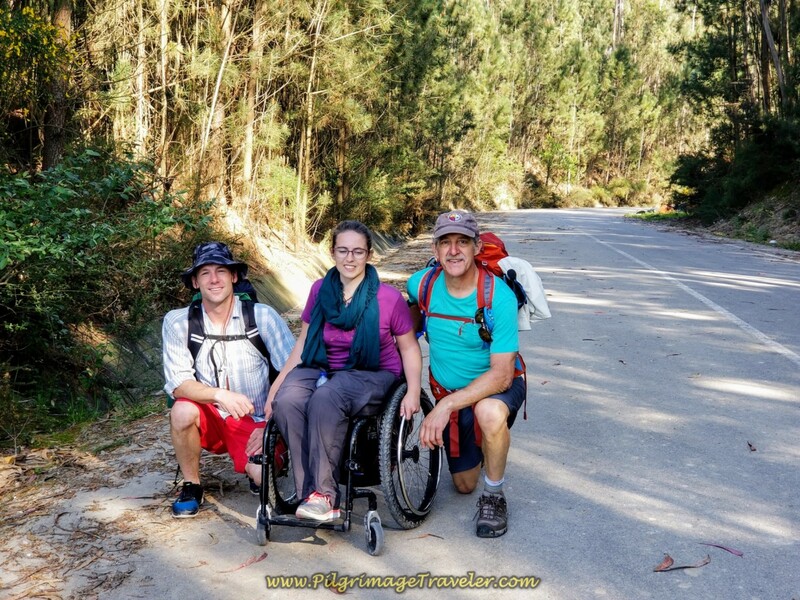 The young woman introduced herself as Magdalena, from Austria (no there are no kangaroos there - ha - our inside joke), and she stated that she was trying to select the best wheelchair route. We listened to her decision-making process. She wanted to see the historic bridge on the route straight on, but was worried that the Way following the bridge would be too hard for her to negotiate. The alternative was to stay on the busy N306. Without hesitation, Rich, whose own sister was in a wheelchair for many years, said, "Come with us, we'll push you out on the other side!" I looked at Matt for confirmation, and he also quickly agreed that he would help push her. We agreed that running along the busy highway was no choice at all. We would have to see the bridge! We set off on the forward route, which shortly leaves the N306 to the right and proceeds to steeply descend toward the River Ave and the 12th Century bridge. 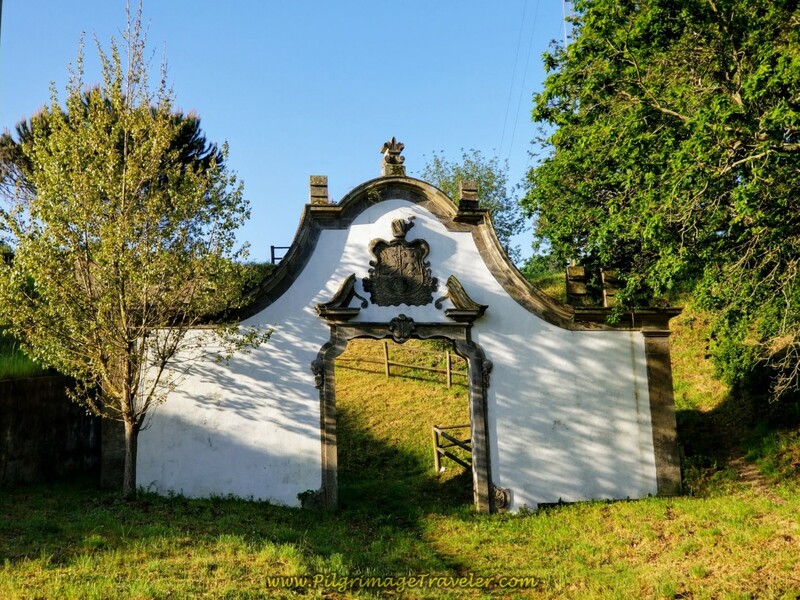 Along the way is the Monumental Gate to pilgrims, below. 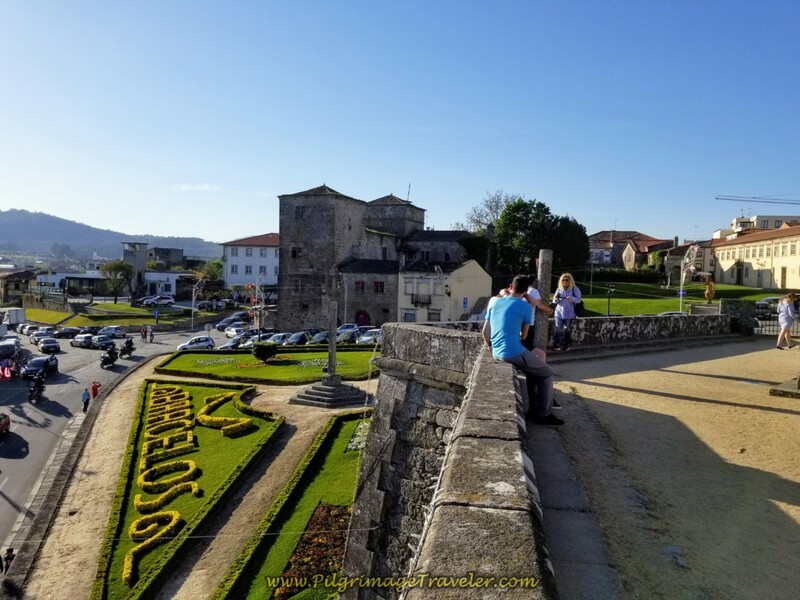 Magdalena whizzed down the smoothly paved Rua da Ponte de Ave in no time at all and wheeled herself onto the bridge, gazing into the waters. She arrived long before we did on foot! 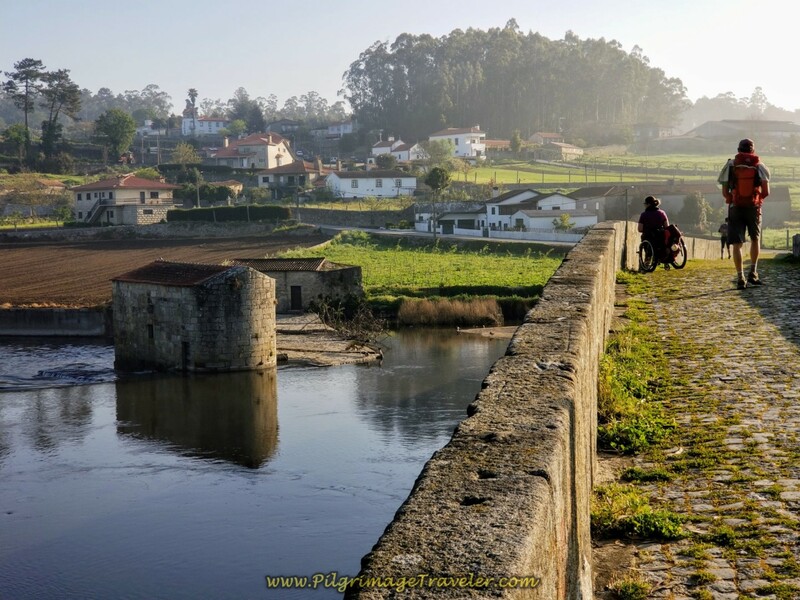 Seeing this young woman on the bridge warmed my heart, and for me, sealed her fate on the Camino. 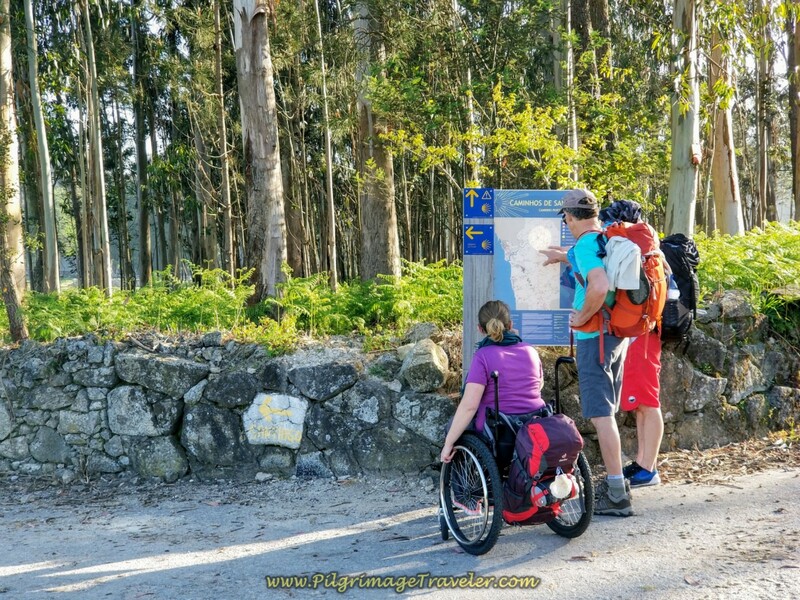 What a free and courageous soul she was to undertake the Central Route of the Camino Portugués in a chair! And she had come alone! However, the men were to have their work cut out for them on the other side. The steep ascent on cobblestone from the river was not for the faint of heart. 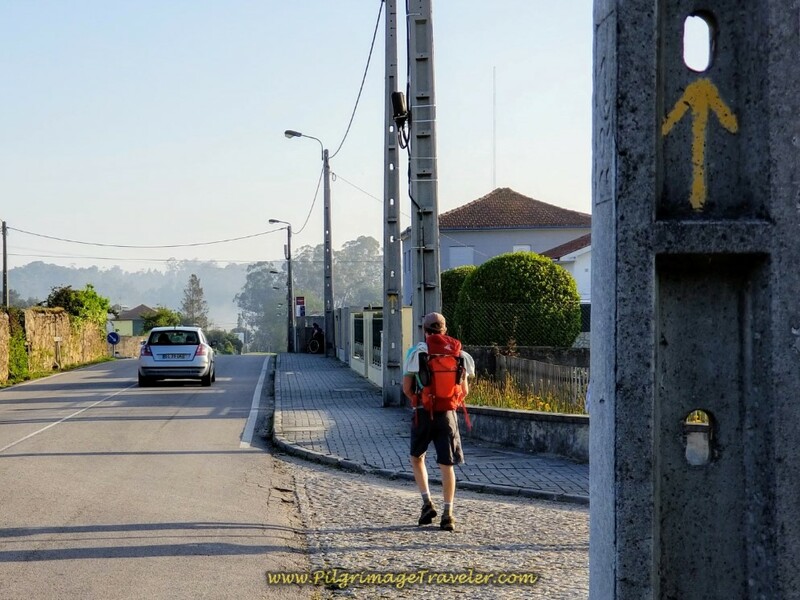 You can see this "V" dip in the elevation profile map above, for day sixteen on the Portuguese Camino. Rich put his head down and went to work, as you can see below. I had trouble keeping up with him without pushing! The volunteer fireman kicked in bigtime! Just beyond the bridge is a fountain, if you need water. 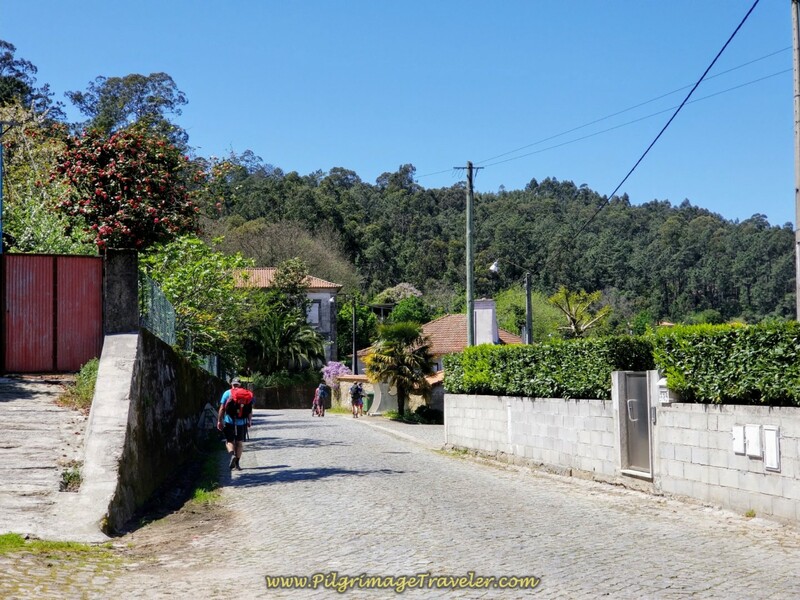 The next three kilometers to São Mamede, the next town, were to be difficult and uphill, on cobblestone the whole way, even though these next photos do not really show the altitude. Rich and Matt shared the job of pushing Magdalena most of this way. After only about one more kilometer from the bridge, we came to a T-intersection where we turned right to re-join the N306 and came to yet another decision point. 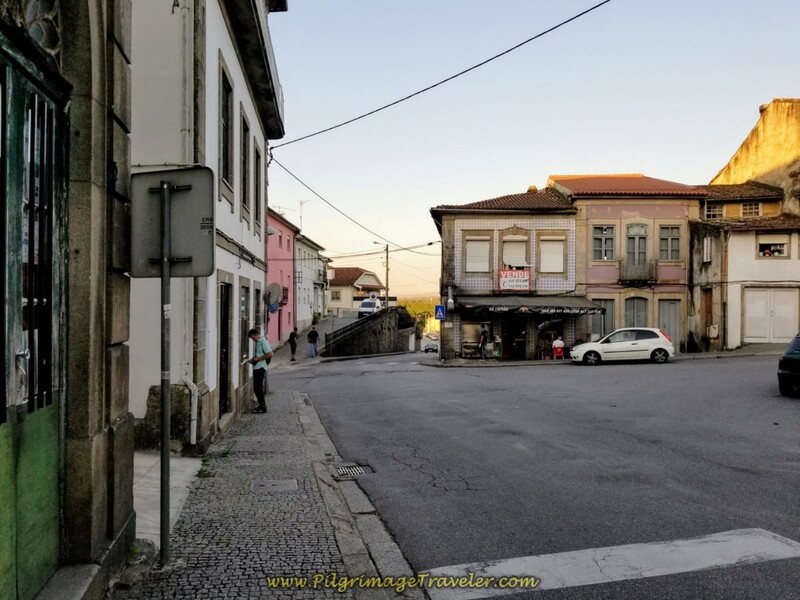 We all decided NOT to continue on the highway, as before, but the guys would continue to push Magdalena, as we took the left turn onto the Estrada de Santagões toward the town of the same name. This was a nice paved and more flat road for a brief while. 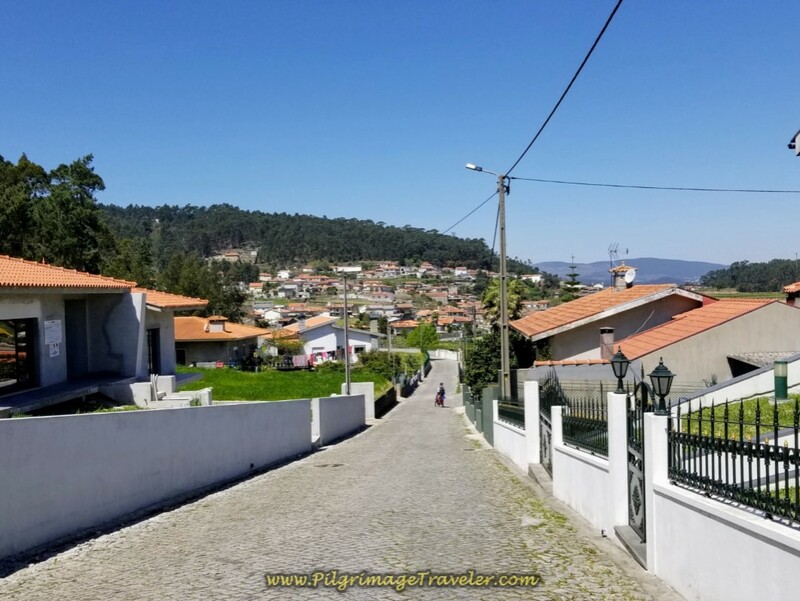 Within another 1/2 kilometer, we turned right onto yet another cobblestone road in Santagões, below, called the Rua de São Miguel. 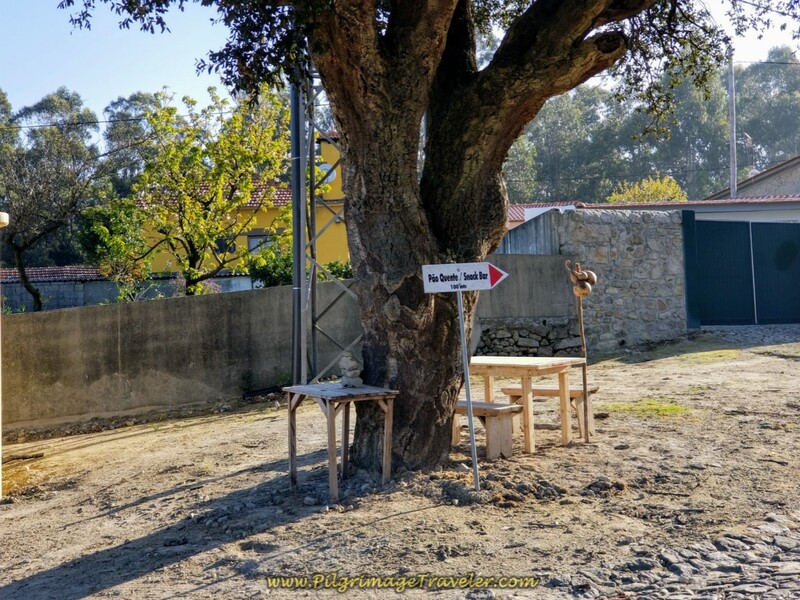 After only a few hundred meters, we came to an intersection, with a nice picnic table and a sign for the Pão Quente Snack Bar in Santagões. It looked welcoming, however we were just barely 5.0 km into the day. It was too soon for a stop for us, so we turned left here as directed. 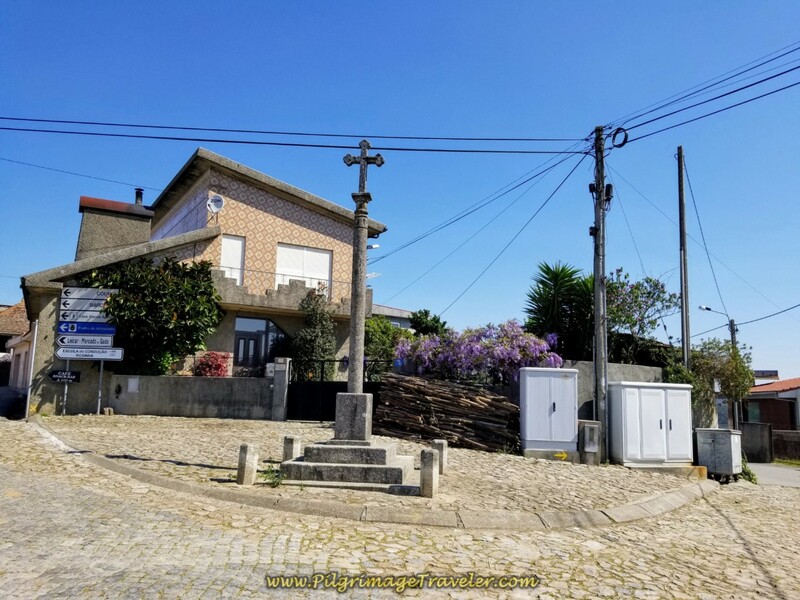 We took an almost immediate left again after the snackbar, at this intersection, below, leaving Santagões on the way to São Mamede. A short distance on the M525 and we turned again onto another quiet cobblestone road. This uphill trek on the cobblestone was wearing on me. I had somehow developed a small blister on the outside of my right big toe the prior day, without even knowing about it. I had put Compeed on it, so it didn't really bother me, however, my right hip was talking instead! It didn't like it! I can't imagine how the guys felt, pushing the wheelchair, as they did throughout all these cobblestone roads. The cobblestone ends abruptly and becomes a farmer's lane, where we had a brief reprieve from the cobblestone, photo below. Magdalena was easily able to propel herself through this section. All of a sudden, the dirt lane turned to a muddy mess, a situation very difficult to negotiate with a wheelchair. Matt took a turn a pushing Magdalena through the mud. Here we are, having a look-back at the cause of the mud. A drainage pipe pouring its contents onto the road! 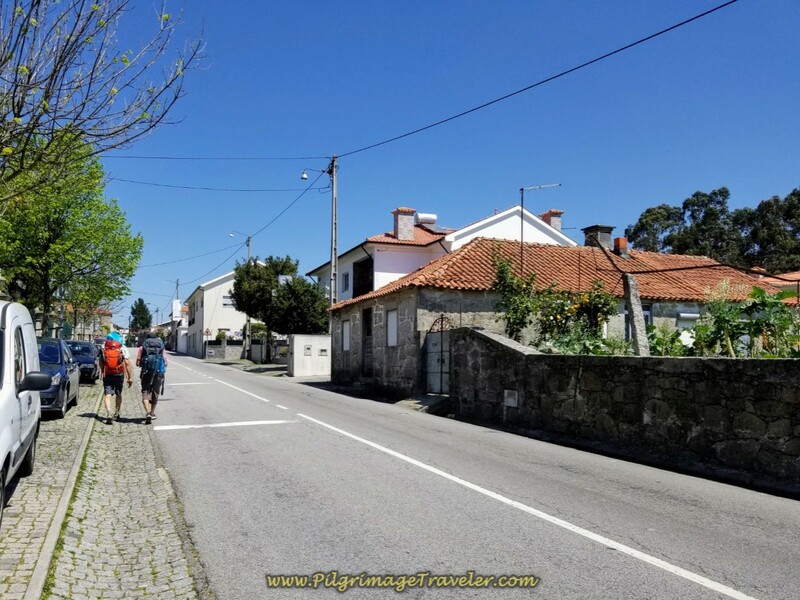 At about the 6.0 kilometer mark on day sixteen of the Camino Portugués, Central Route, we came to the N306, where the highway route would have rejoined the scenic route. 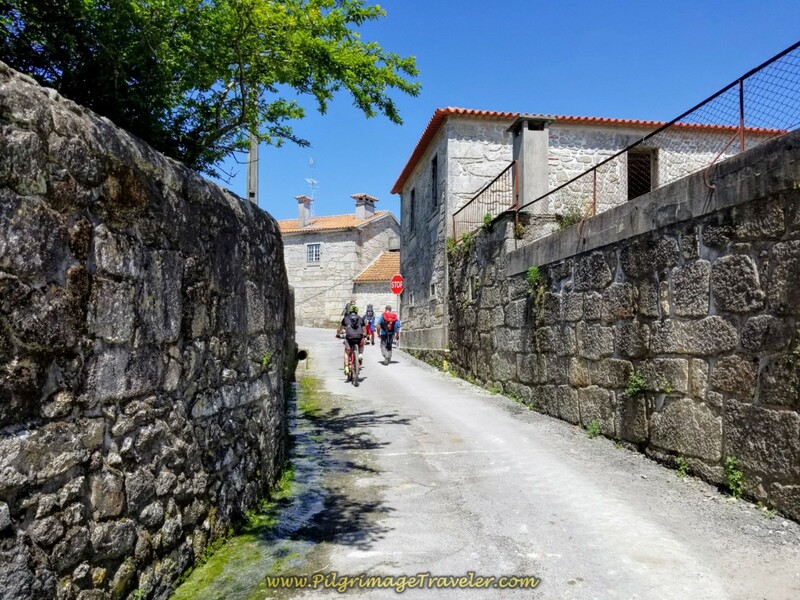 Here in São Mamede, we crossed over the N306 and turned onto yet another high-walled, scenic cobblestone road, taking a nice scenic route through town. 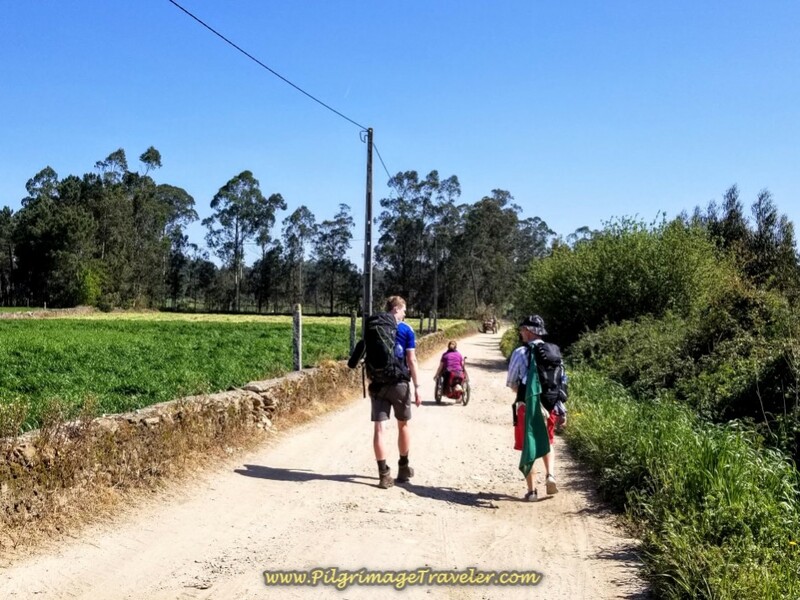 Leaving town in a northerly direction the Camino uses a nice paved road for about 1.5 kilometers, as it winds down and under the A7. Magdalena was in her independent glory through here and flew down the road ahead of us. The pavement continues on the E805, where we pause for a breath and a photo. The pavement then becomes a dirt lane soon after the tunnel under the A7. 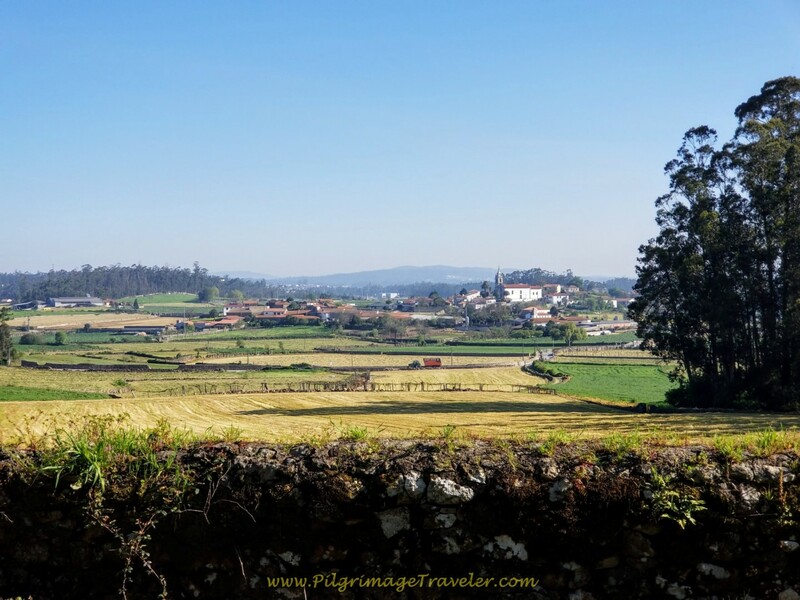 The Portuguese countryside is stunning as the views opened shortly onward. 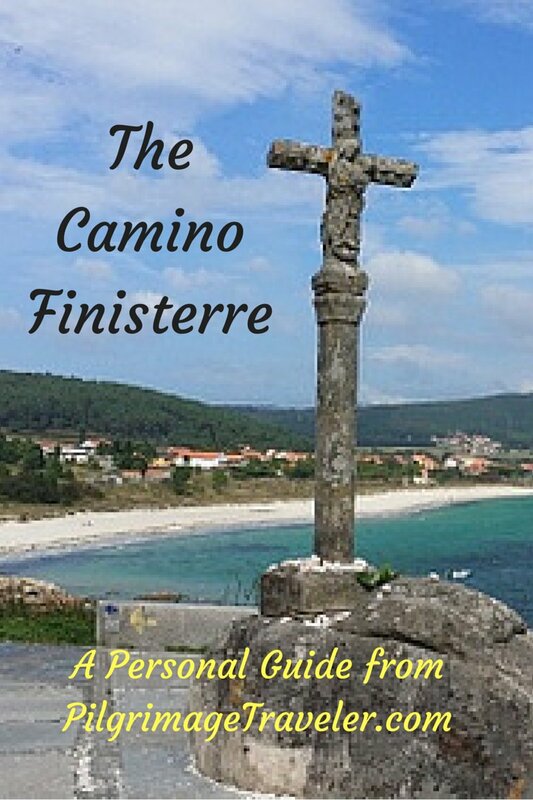 Within 1/2 kilometer, the Camino joins the N306 for a few steps. It was here that Magnus caught up to us for the day. He was surprised to see us with Magdalena in a chair, as he joined in with the group. 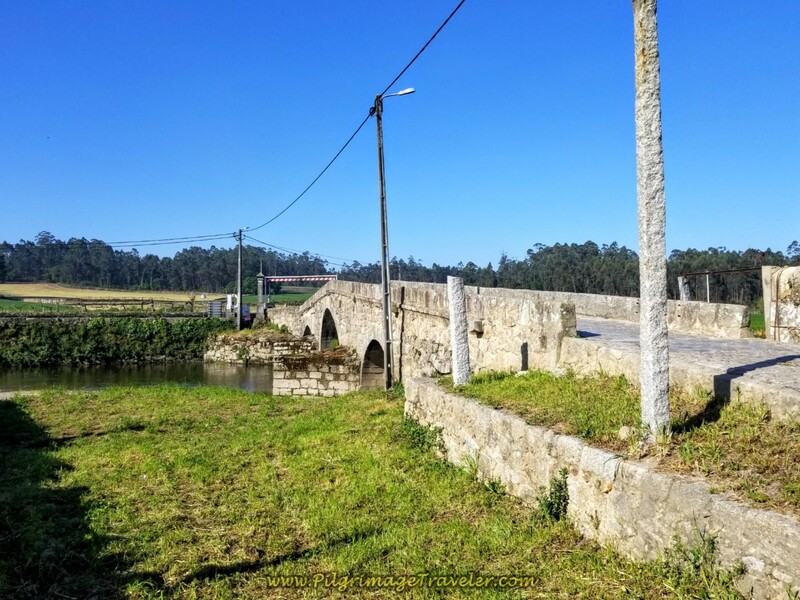 After a left turn off the N306, we came almost immediately to the Ponte de Arcos, the bridge, perhaps of Roman origin shown below. There is little information about this particular bridge, and a bit of speculation. 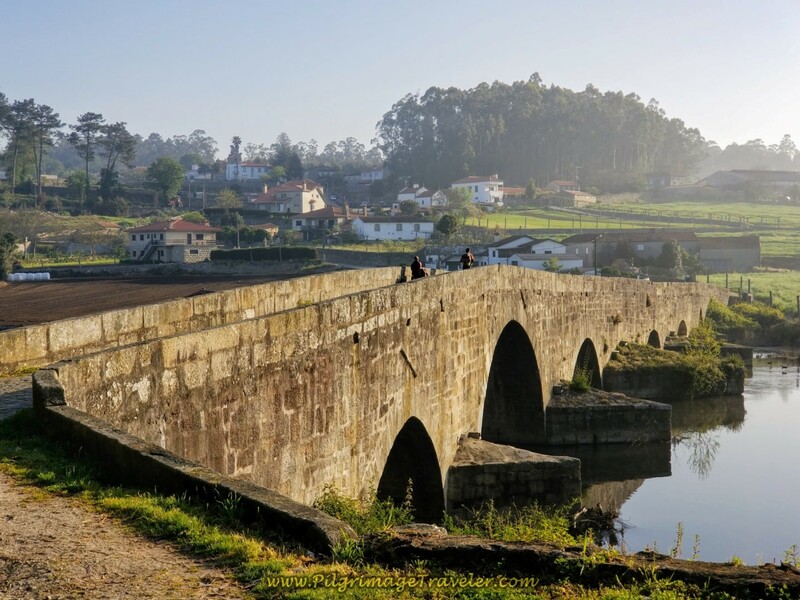 It was on the main Roman road from Porto to Galicia, that is certain, and also certain is that it is an historic bridge. 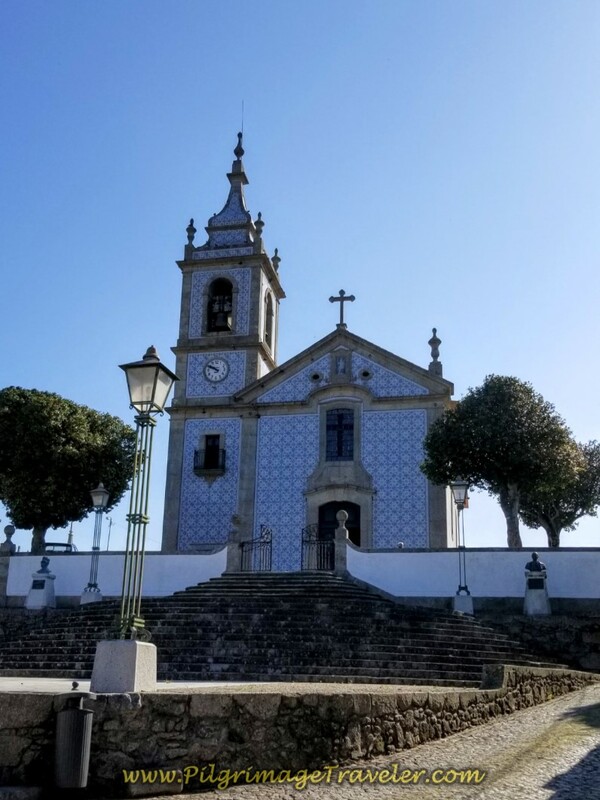 Bending on the road through the town of Arcos, we turned right at an information board in town, and past this beautiful azulejo (blue-tiled) Church of Arcos. 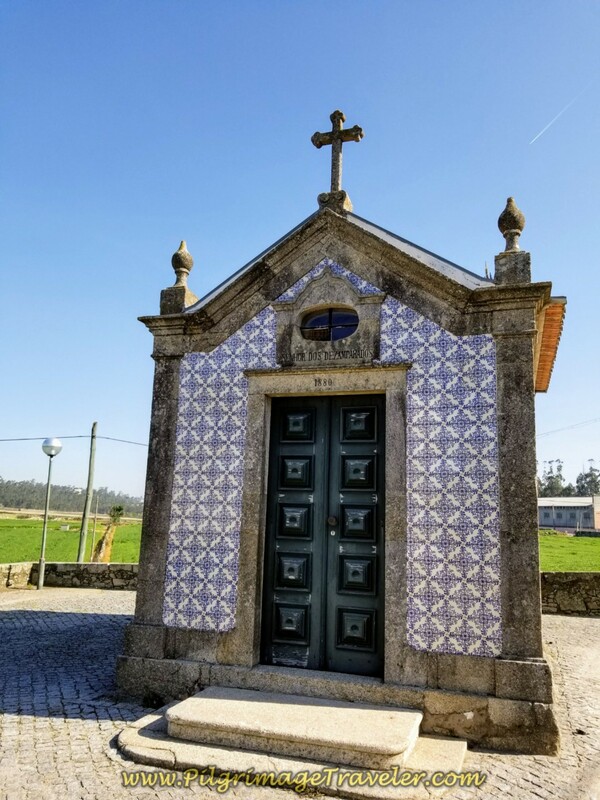 I never tire of these Portuguese tiled wonders! 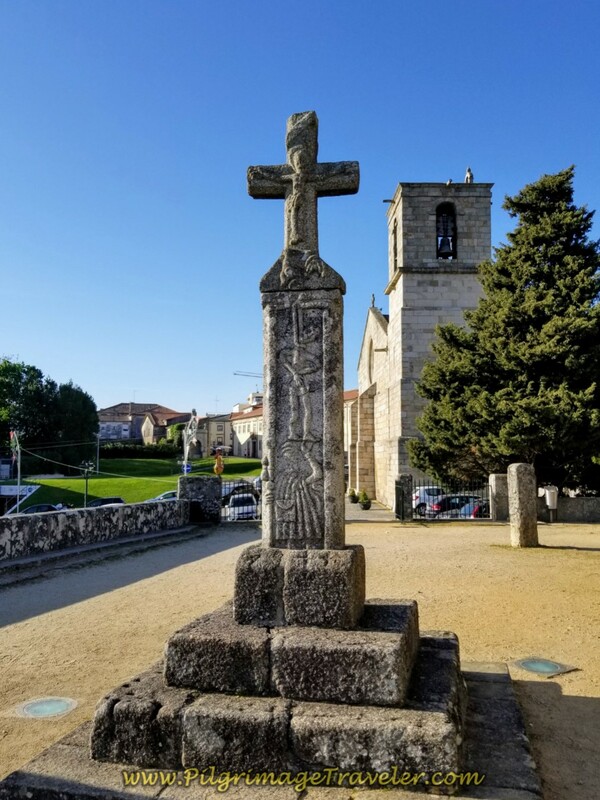 Just beyond the church, the Camino turns to the right here, at the cross in town. Not much farther on is this lovely little chapel. And across from the chapel a café definitely called our name! We were perhaps 9.0 kilometers into the day, so it was time to get our second café con leite. Rich was especially happy for the boost, since he had exerted so much already pushing Magdalena. 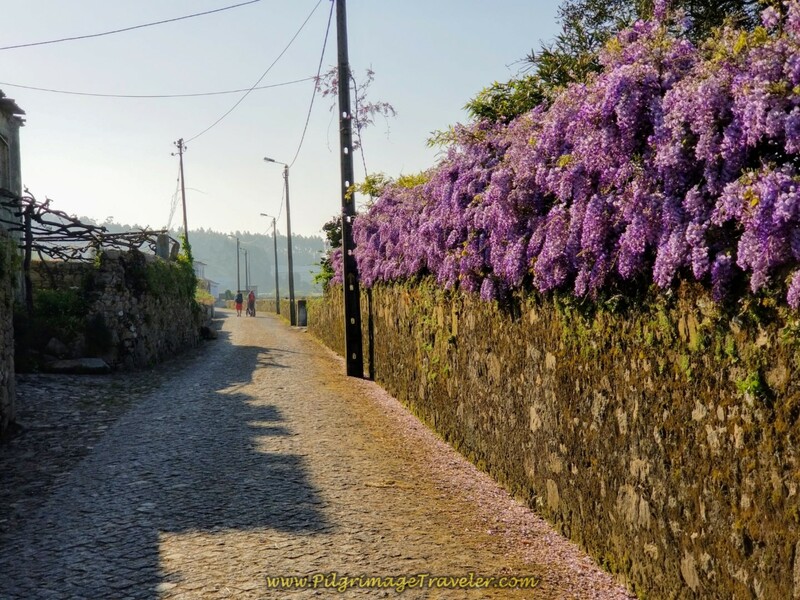 If you need a splurge, and your day ends in Arcos, right along the Camino in Arcos are these three accommodations: Casa S. Felix, Quinta São Miguel de Arcos and the Villa d'Arcos. See the map above for their locations. 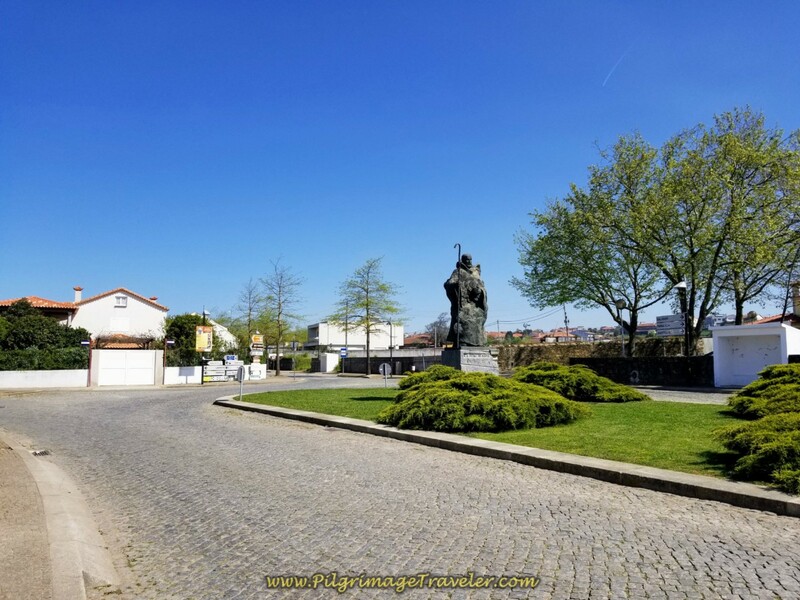 We walked on after our break, essentially a straight shot north on uninteresting pavement for almost 3 kilometers, until this roundabout and statue in the next town of Rates. Easy for Magdalena, boring for us on foot. 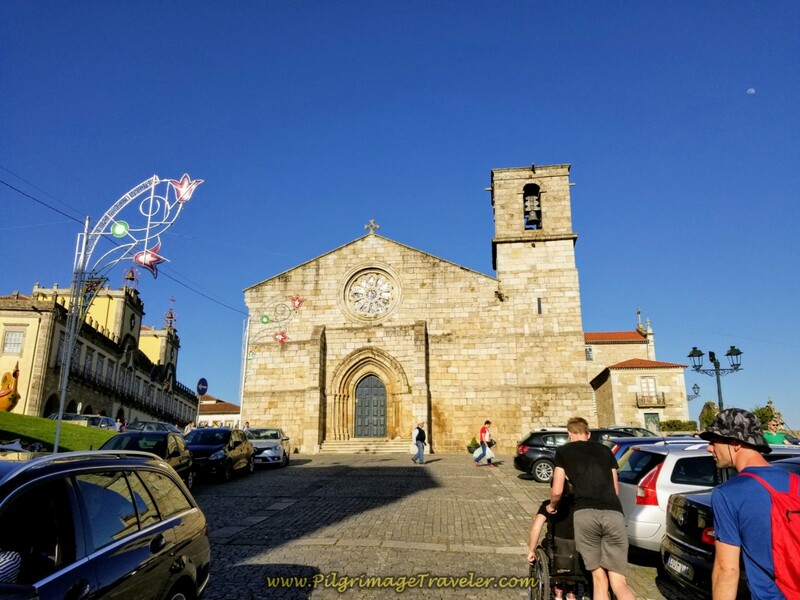 There is an 11th century Romanesque Church in town, the Igreja de São Pedro de Rates, one of the oldest of its kind in Portugal. It is now a museum and worth a stop if you have the time and energy to see it. Click here if you want more information about this church. 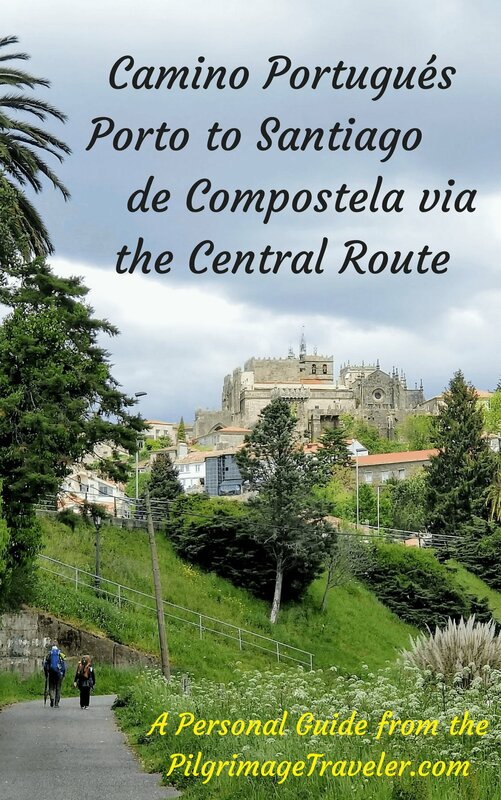 I did not know about the church, and since it is a ways off the Camino, we didn't see it as we walked on through the east side of town, shown below. 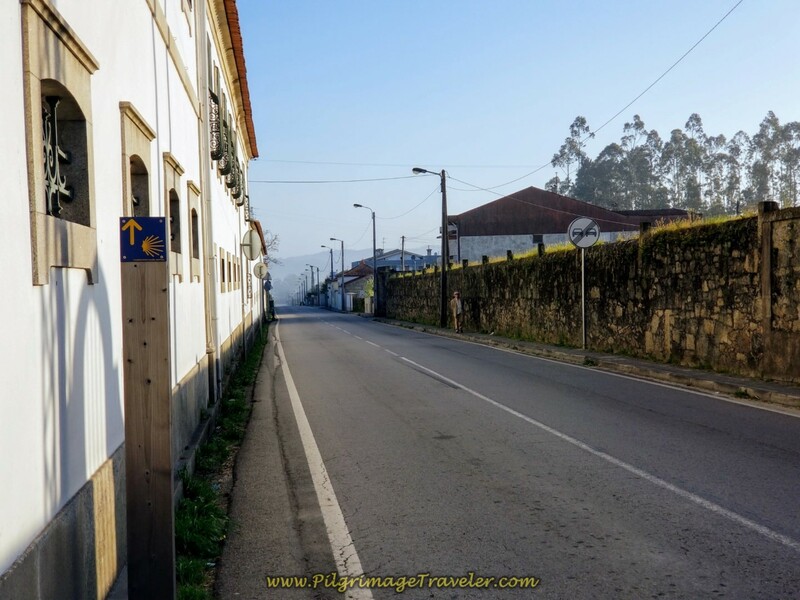 There is an albergue in Rates, as the small blue sign below signifies; the Albergue de Peregrinos de São Pedro de Rates. 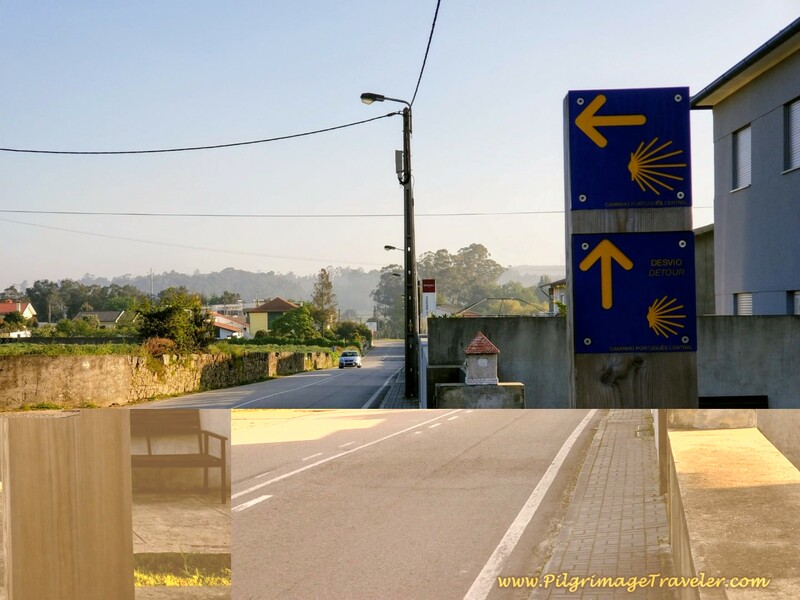 I did not take a photo of the albergue, but it is steps from the sign here, where the Camino turns to the right, following the sign. According to Gronze.com, there are 50 places here in four rooms, so if you need to stop for the night, most likely you will have a bed. 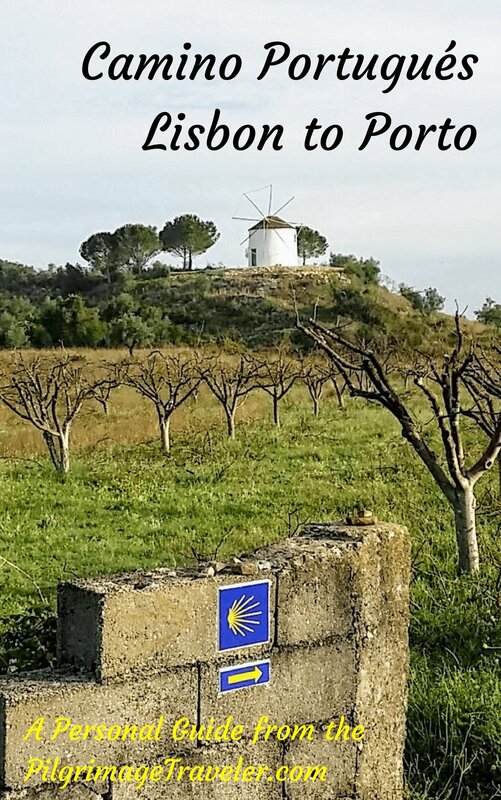 There is also the Casa de Mattos a few steps off the Camino, just to the left of these signs, above, a "turismo rural." Click here to see more information about it. Farther on in Rates, at this cross the Camino goes to the right. 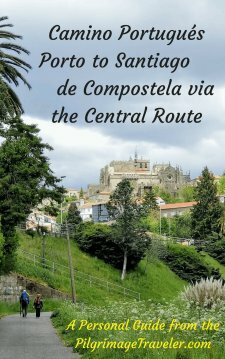 There are several cafés near here, just off the Camino. You may want to seek them out. I did not mark them on my Google map, but they are easy to find if you look. About 1/2 kilometer after the cross in Rates, on the CM1129-3, the cobblestone turns to a dirt road. Nice and flat and even, shown in the photo below. We did not understand what lay ahead! And then, quite suddenly, the road turns to mud, full of ruts and run off! Not easy for our chair-bound friend. 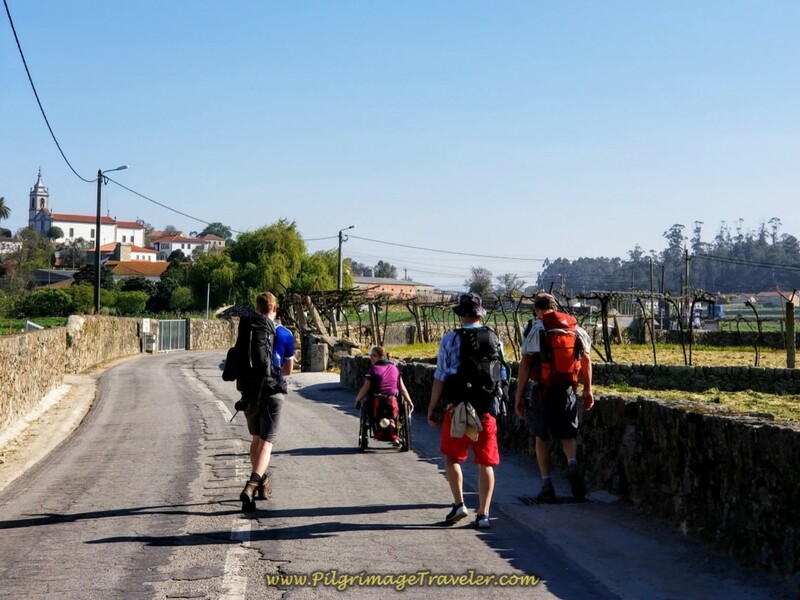 But the Camino was there for her and two more able-bodied Portuguese men suddenly appeared! 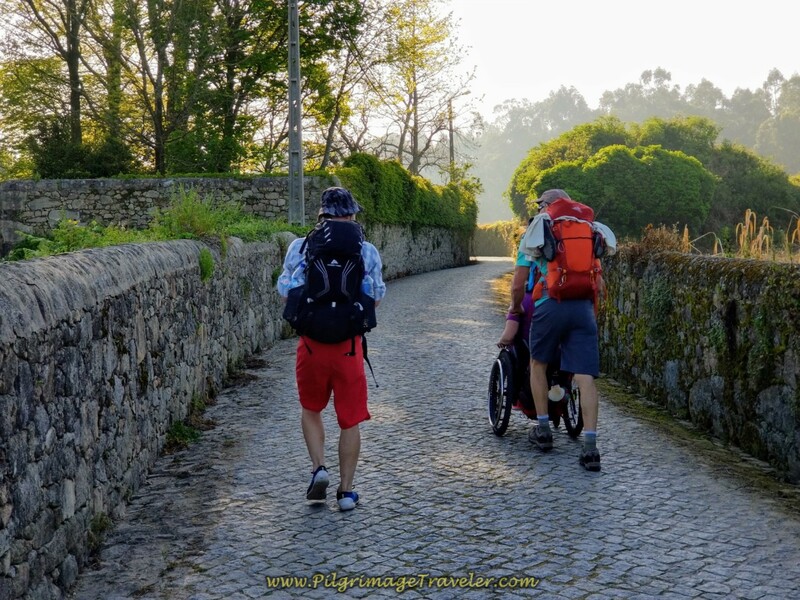 Talk about the Camino providing! I just ran along and documented it all. What a feat! 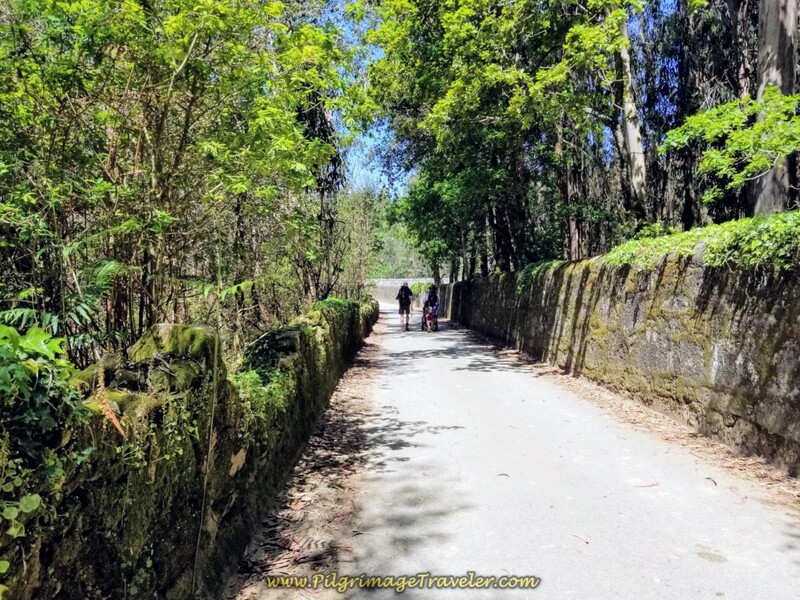 Interestingly, the road here, after crossing over from the Porto district to the Braga district, is now called the Rua Caminho de Santiago! 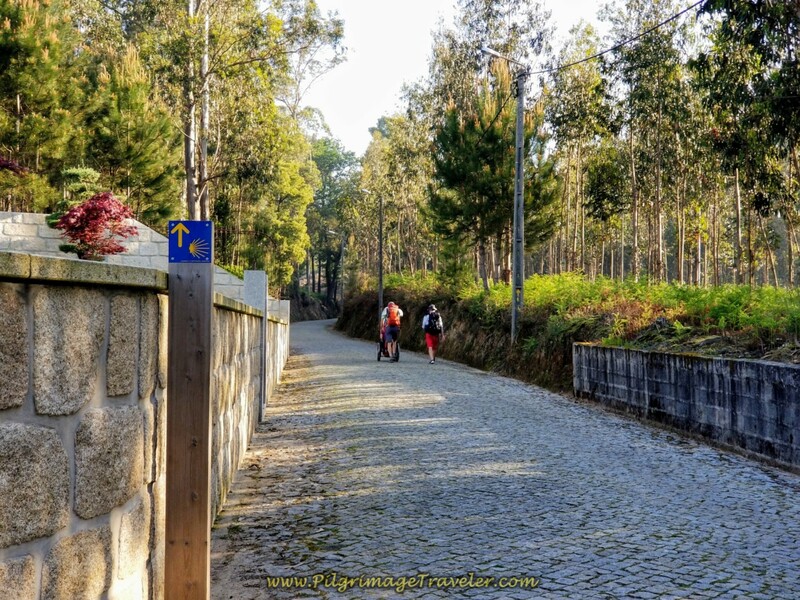 What could be more appropriate than the Camino de Santiago street? Sounds like an authentic route, doesn't it? Here they all are, the Magdalena Mud Team! Pedro and Jorge from Portugal who just joined us, Magnus, Rich and Matt. They took turns, half-guiding, half-carrying Magdalena's chair and exerted some serious energy getting her through this tough portion. Magdalena's courage stayed strong through it all! 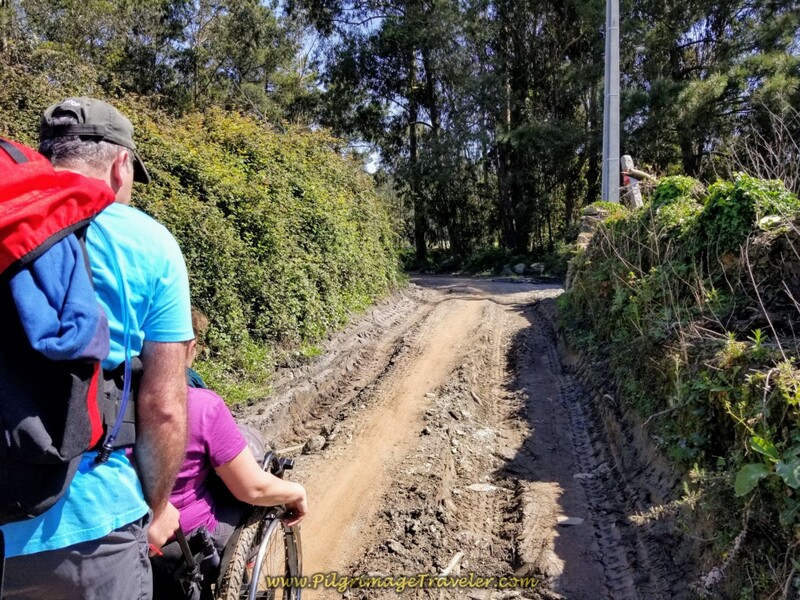 The Rua Caminho de Santiago levels out farther on, but the ruts were still there. Here Pedro takes the wheels. 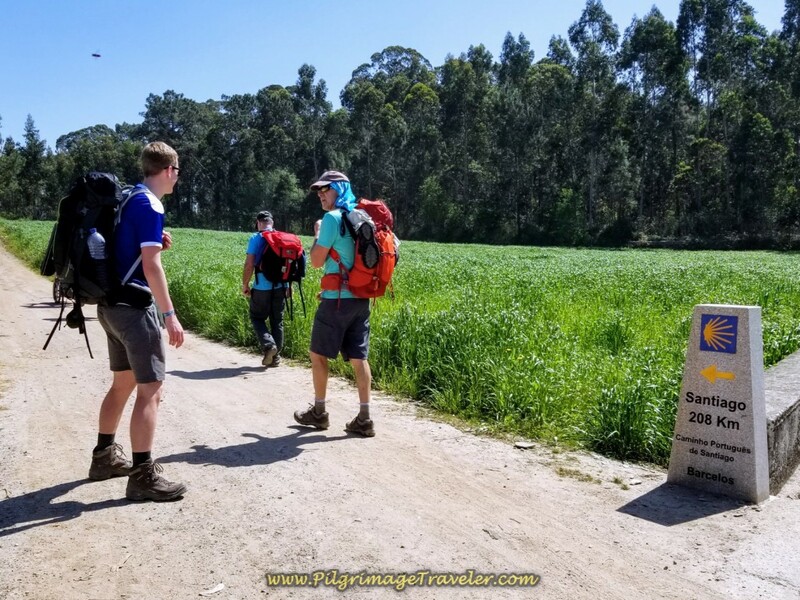 And then at last, the dirt road gets better, but the guys continue to take turns pushing Magdalena on day sixteen of the Central Route on the Camino Portugués. And then near disaster strikes. As Magdalena was being wheeled along, a piece of metal suddenly fell off and onto her tire. A screw had come off of her inside wheel fender piece! It must have been all that bumping around on the ruts that shook the screw loose. And amazingly, the Portuguese men went to work. As it turned out, Pedro is a physical therapist (also known as a physiotherapist in Europe). He was an expert in wheelchair maintenance! What were the odds? Then to add to the miracle, the wheelchair piece broke right outside this man's house, below, an eccentric artist who had lots of screws, nuts and bolts to choose from! Literally, within a few minutes the wheelchair was fixed! Disaster averted! We carried on, and soon stumbled upon the first granite waymark, with kilometer readings on it! We all stuck together as a team full of purpose! I was so grateful for all the men that we had collected to help Magdalena on her pilgrimage. 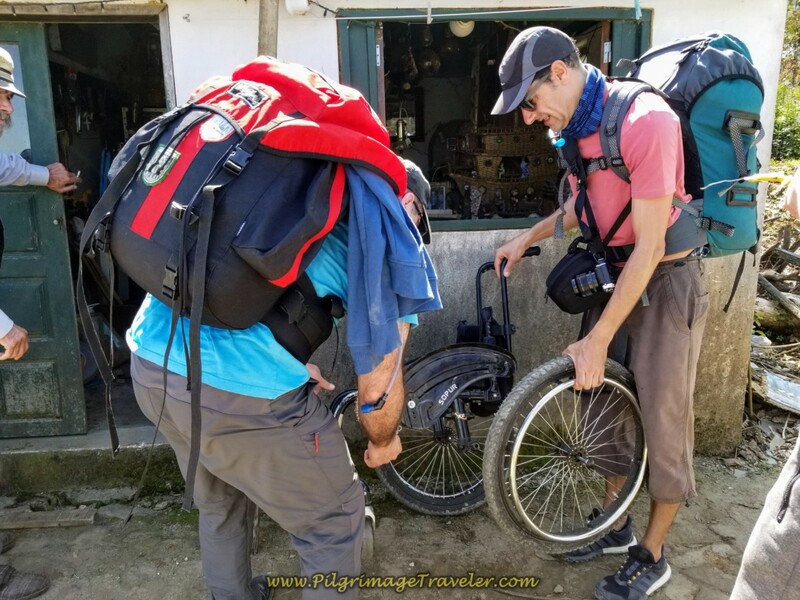 I was not strong enough to do any wheelchair pushing on anything but totally level terrain. It was enough for me just to walk my own posterior along! 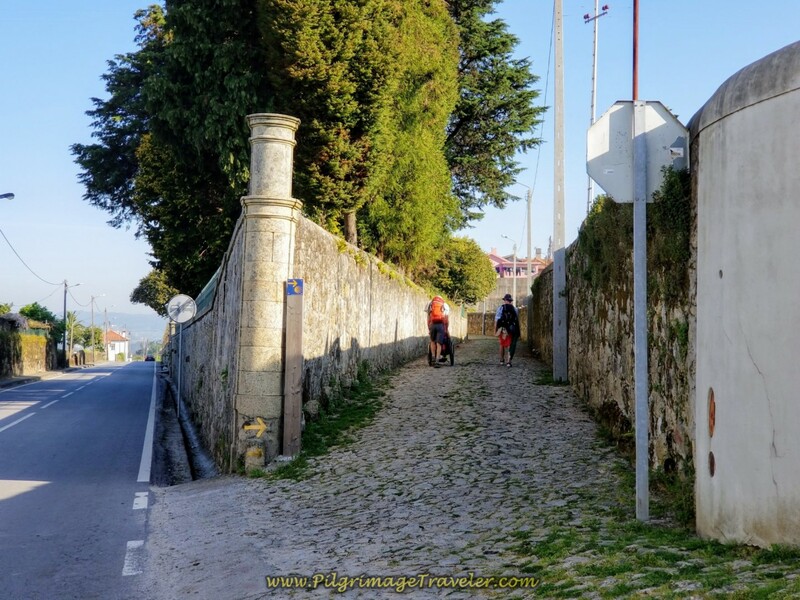 After 3.0 full kilometers on the Rua Caminho de Santiago, it ends here at the intersection, below, as the Way turns left onto the Rua de Ferrado. 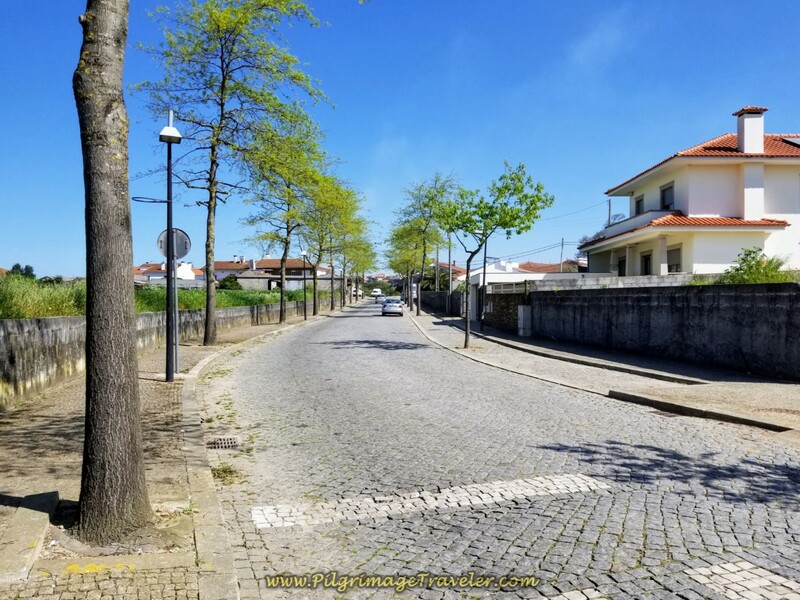 After 250 meters, the Way turns right on the Rua do Quintão, then another 1/2 kilometer, a left turn, on farmer's lanes that join the pavement in about another 1/2 kilometer to walk into the next town of Pedra Furada. 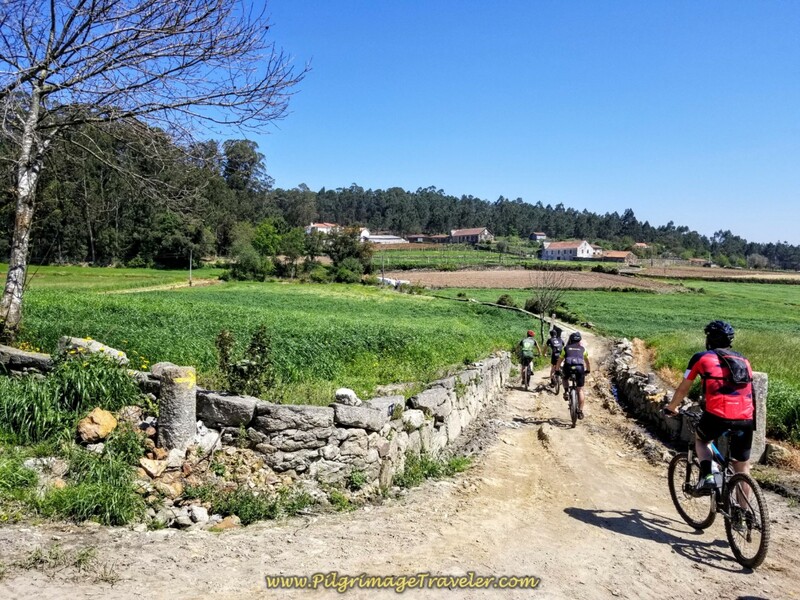 Here is Magdalena free wheeling through the lovely Pedra Furada countryside. 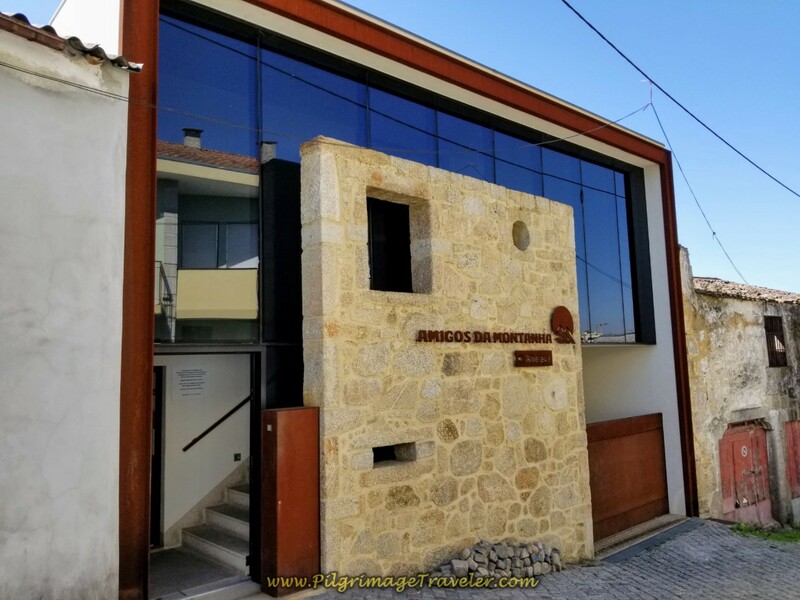 And then within a few hundred meters, the Camino once again joins the familiar N306 in Pedra Furada, to walk by the municipal albergue, the Albergue António, shown below. 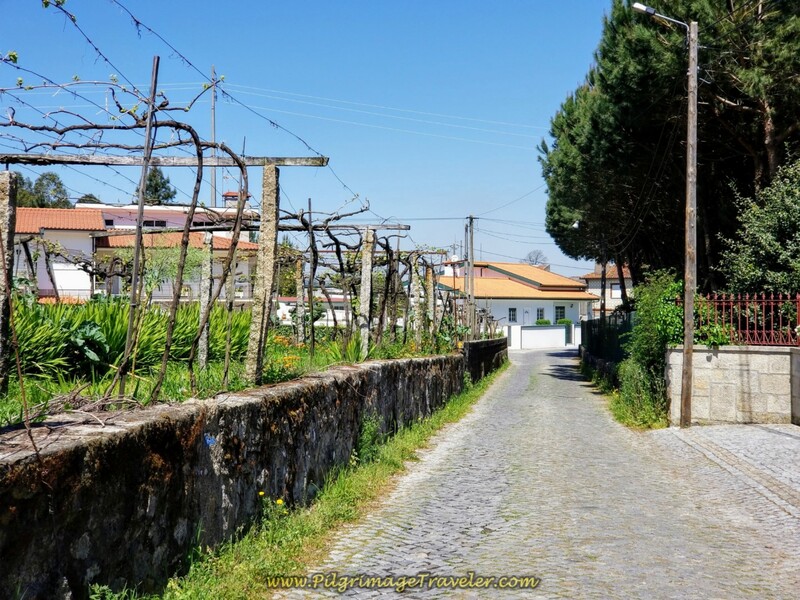 A few meters onwards is another choice of accommodation, the Quinta de Santa Leocádia. 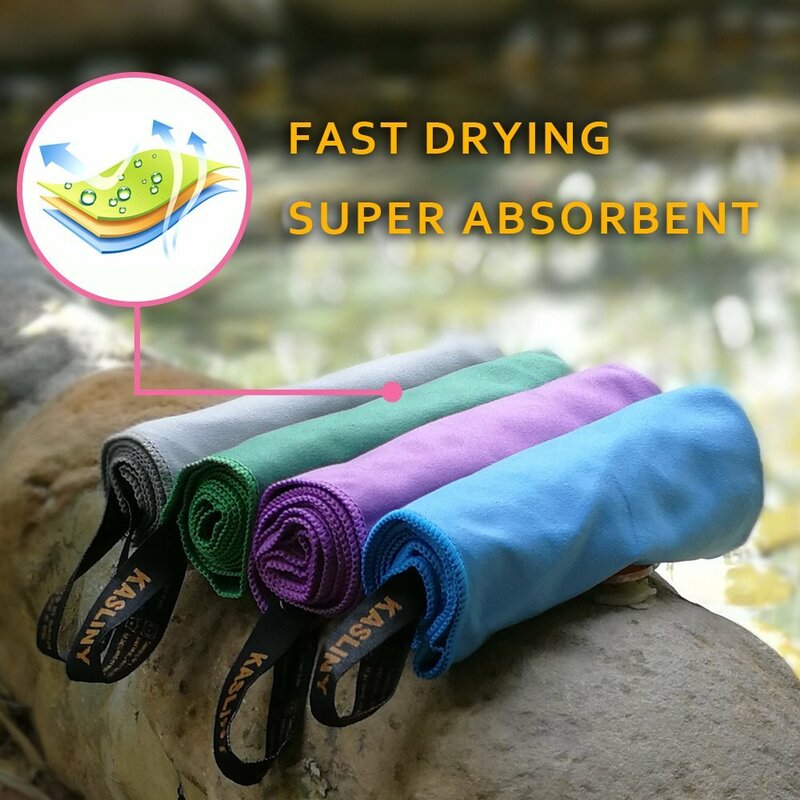 If you click on the link, you can see that this is a luxurious place! We walked onward. 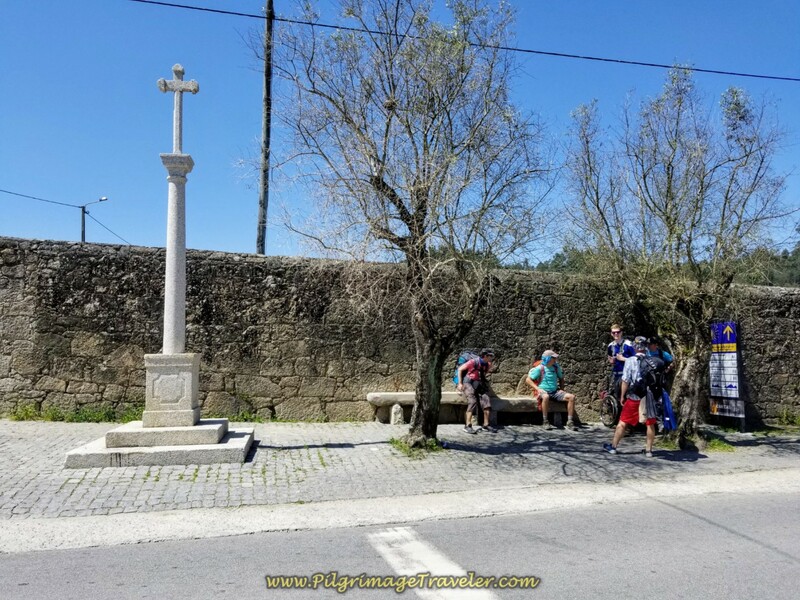 Within a few more steps in Pedra Furada, we came upon a nice information board by the cross at an intersection, showing that the nearest albergue in Barcelinhos was 9.0 kilometers ahead. Yeah! 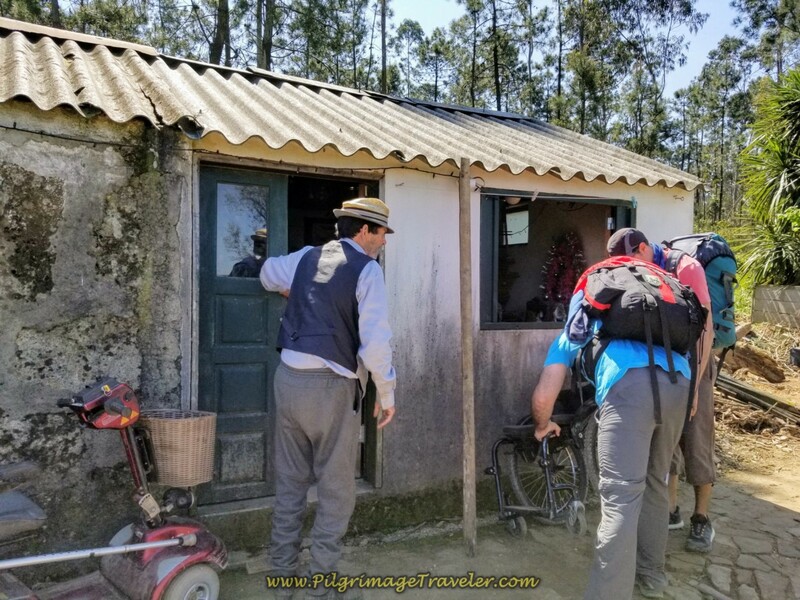 One of the closet albergues was our group's planned destination for the day, the Albergue Amigos da Montanha. I thought this was a perfect time and place for a snack break, 2/3rds into the day, so I took off my boots and aired out my feet, while munching on my food as others conferred with the map to sort out our location. 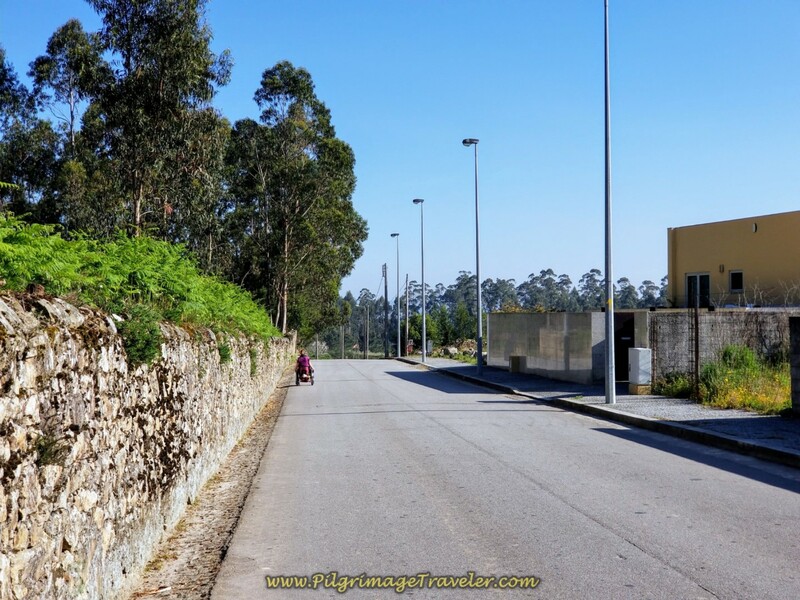 For almost 2.0 kilometers, we merrily scooted along the N306 from Pedra Furada to Silgueiros. Magdalena was in her glory, wheeling along. For the rest of us, not so much! But it was pleasant enough and there were sidewalks for the foot folks to stay safe. Matt preferred to hang with Magdalena, to give the cars a bigger line-of-sight. I saw at least one open café along this stretch on the N306. If you need a break in a café consider your options. 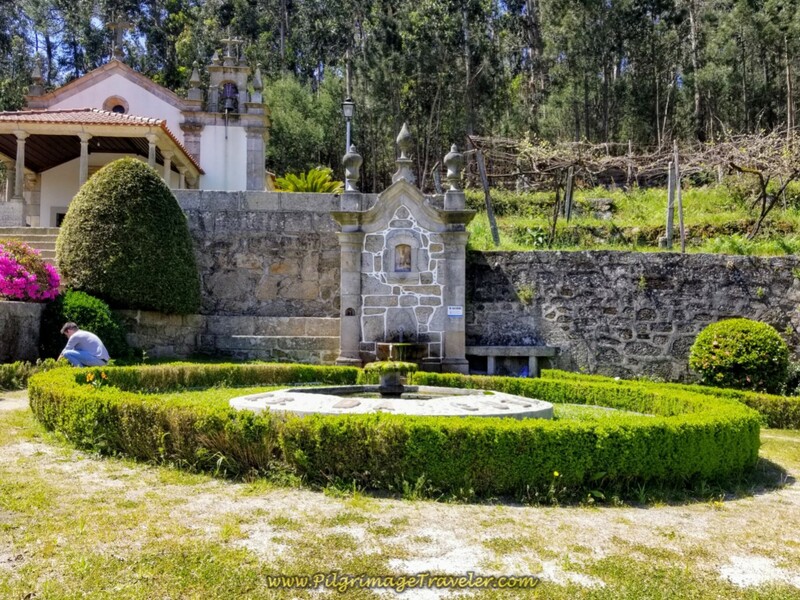 We also passed the fountain and chapel of Nossa Senhora da Guia. This would be a lovely pit stop as well. And here is where we turn off the N306 to begin the final climb of the day, on the Way before Barcelinhos. There is a grocery store to the right, just beyond the turn, if you want to collect food for your dinner (refer to Google map above). A nice lane for about 1/4 kilometer greeted us, then let us out on cobblestone to touch down briefly once again on the N306 only to leave it for the remainder of day sixteen. 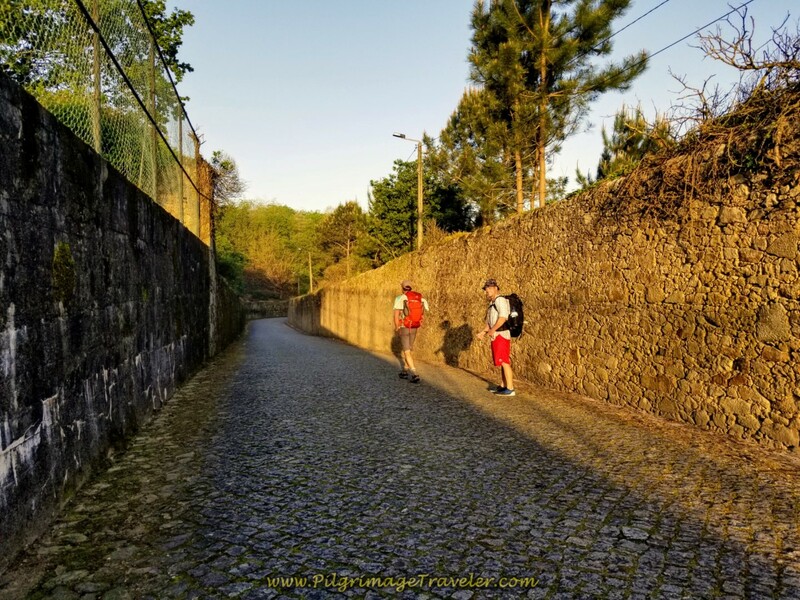 We turned left on the Rua Dos Cruzeiros (Two Crosses Street), having reached the high point of the day, and soon were flying down cobblestone toward Pereira, below. Here is one of the crosses in Pereira, that we came to within 1/2 kilometer of leaving the N306. You can see a sign just beyond it for the aptly named Café do Cruzeiro. 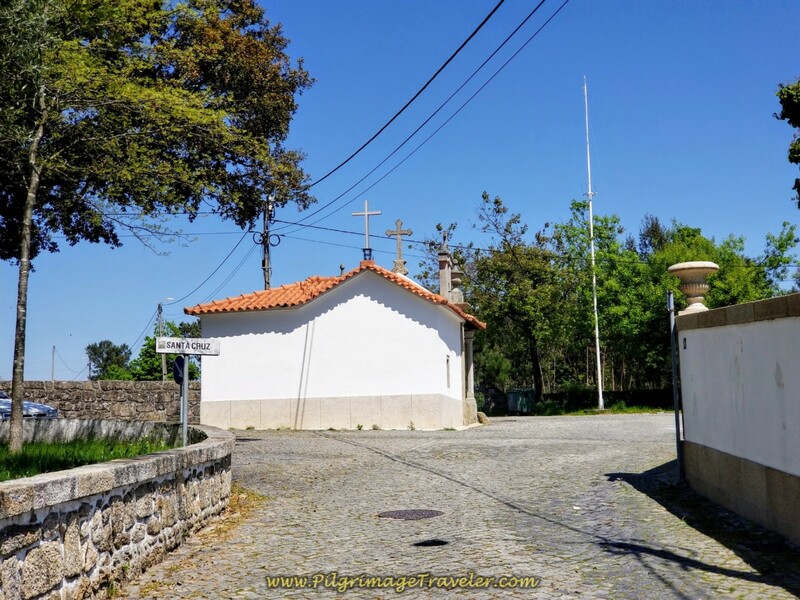 At the cross, we kept straight on, picking up the M555 that we would take us most of the way from here into Barcelinhos. The M555 meaders around though small towns for 1.25 km and crosses under the A11 here. At this juncture we were only about 4.0 km from Barcelinhos and our destination. 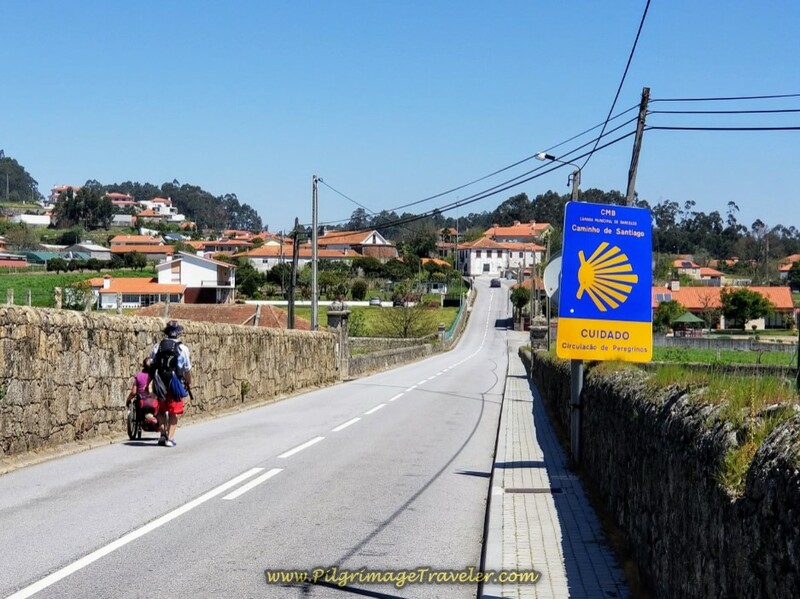 The Camino continues its cruise downhill toward the Cádavo River, shown below, after the highway crossing. There is another grocery store, just meters after the A11 that you may want to look for as you go by. 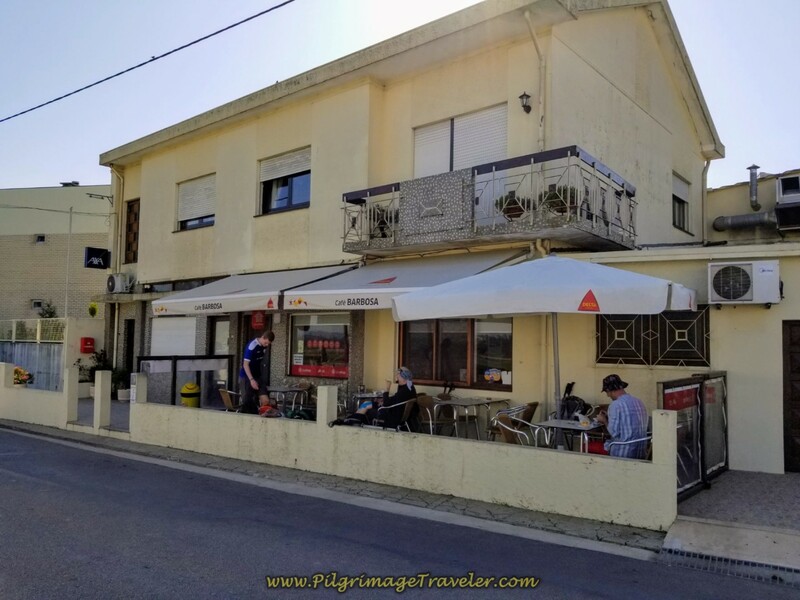 ...to finally arrive by a Renault car dealership and the intersection of the N103, which a lane takes you around and under, for the final downhill approach on the N205 into Barcelinhos. Here is the N205,where it joins the N306 and turns left. 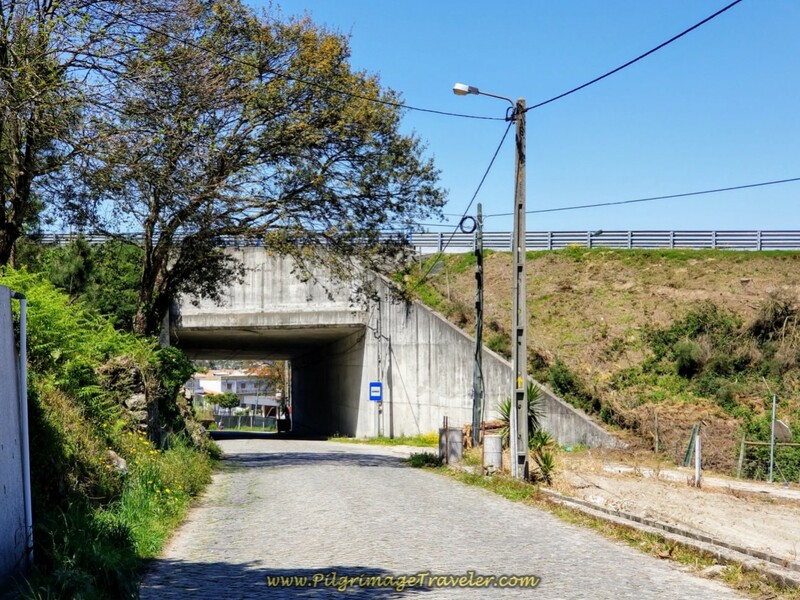 Once on the N306, below, you are in the heart of Barcelinhos and the Cádavo River is just ahead at the bottom of the hill. 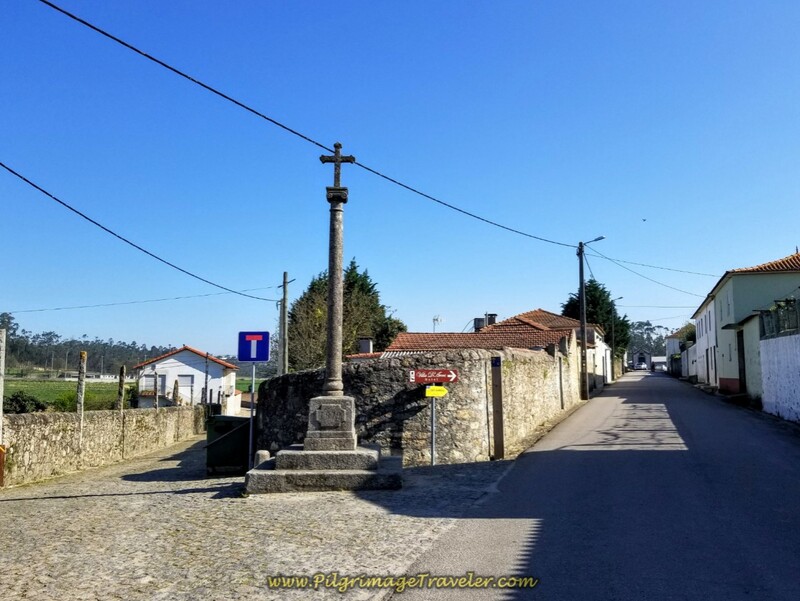 However, we did not cross the river to Barcelos, but ended our Camino here, at the sign for the Amigos da Montanha Albergue. This is not the main entrance on the N306. 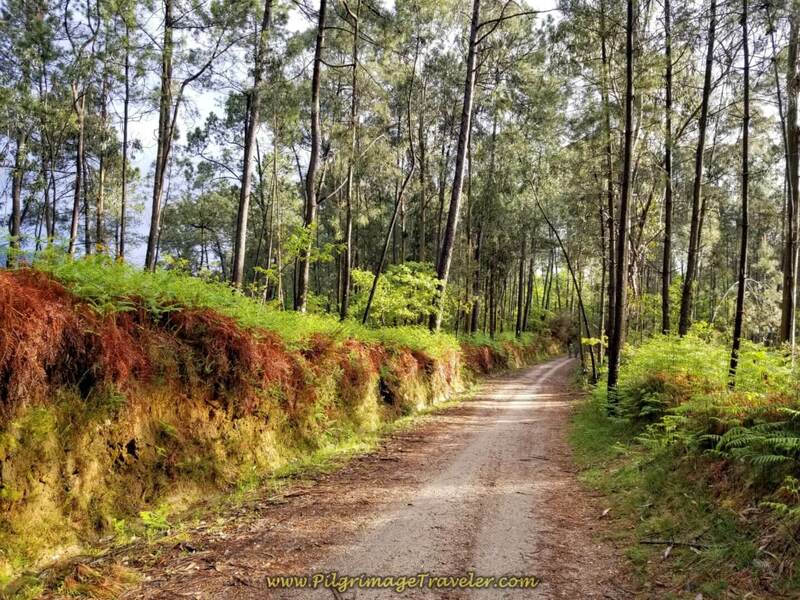 You have to find your way back up the hill, to the left and around the back for the official entrance on the Largo Penedos. The Hospitalera was looking out for pilgrims on the main street and she directed us around to the back. Here is the actual entrance to the albergue. 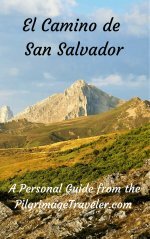 The albergue is quite new and lovely with a well-equipped kitchen. It has only 16 places in one large room, and it was almost full when we were there the end of April. 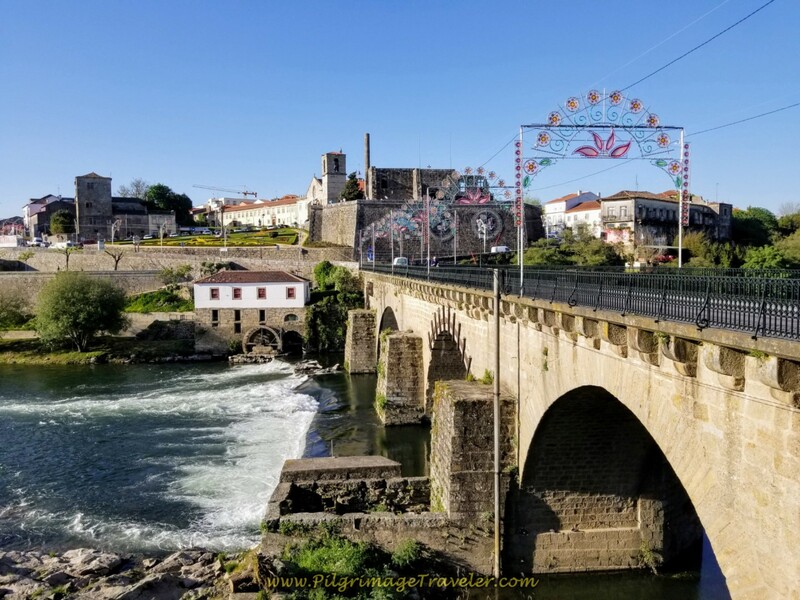 There are many other accommodations in town and across the river in Barcelos. Click here to see more choices. 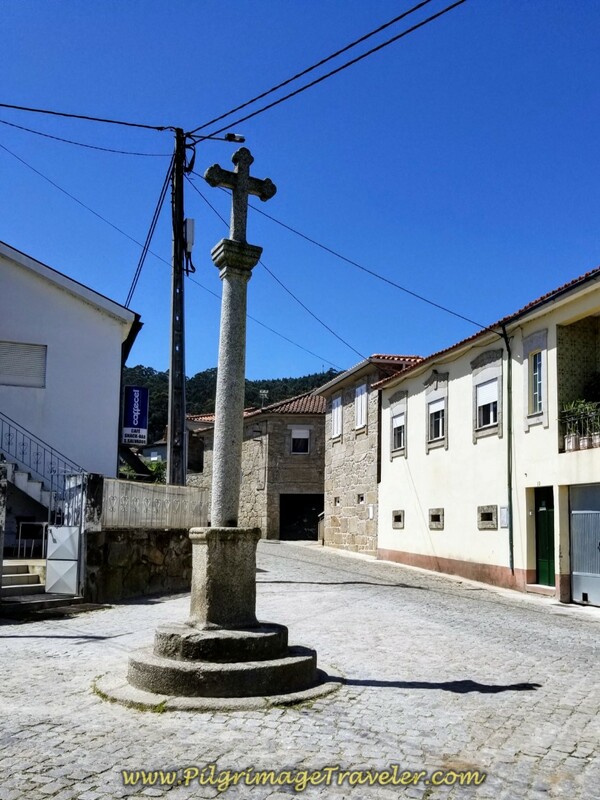 Don't forget to check the Via Lusitana for more albergues that are here as well including the Residência - Albergue Senhor do Galo in Barcelinhos. 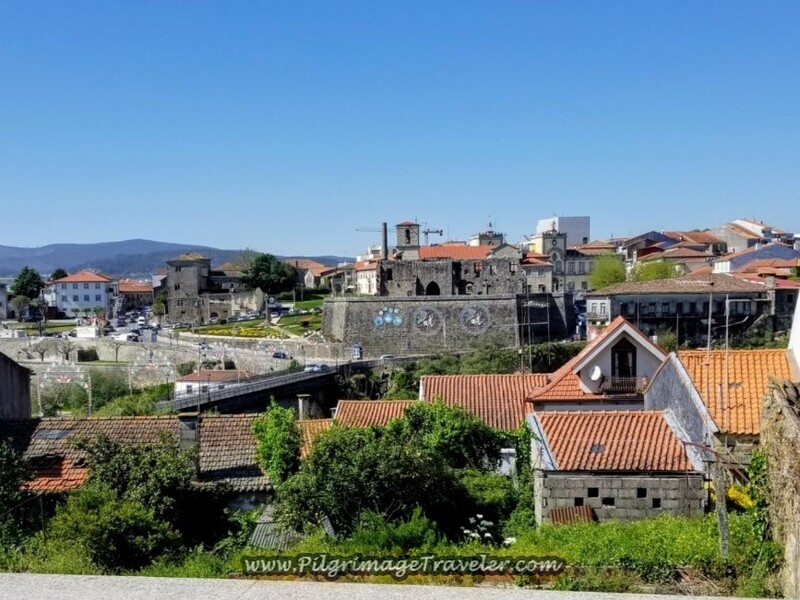 Below is the view of Barcelos and the historic area from the upper deck in the Albergue Amigos da Montanha. My only complaint was that the albergue did not supply blankets, and despite my long underwear and fleece jacket, my sleep sack was not sufficient to keep me warm. It was only 5 Euro/person, so I couldn't complain too loudly. 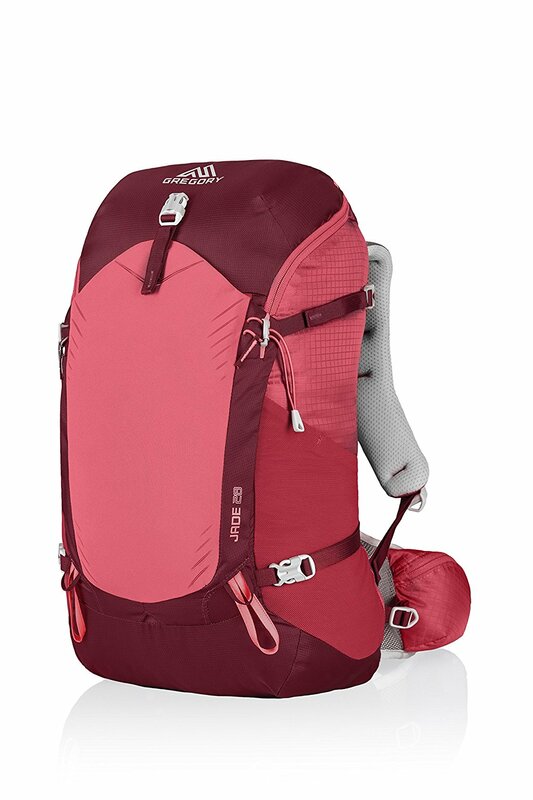 I am currently re-thinking my sleep sack idea anyway and am looking at an ultralight sleeping bag so I won't need to depend on available blankets in the future. Their usual state is not always that clean anyway! I was also surprised by the beds which had vinyl covers on them, and no disposable sheet provided. This was OK with me, as I thought they could easily be wiped down and bed bugs would not like them. However the pillows provided had no disposable cases and I did not know how often the covers on them were cleaned. I tried to keep my sleep sack's pillow pocket over it, without much success. This also led to a rather restless night. 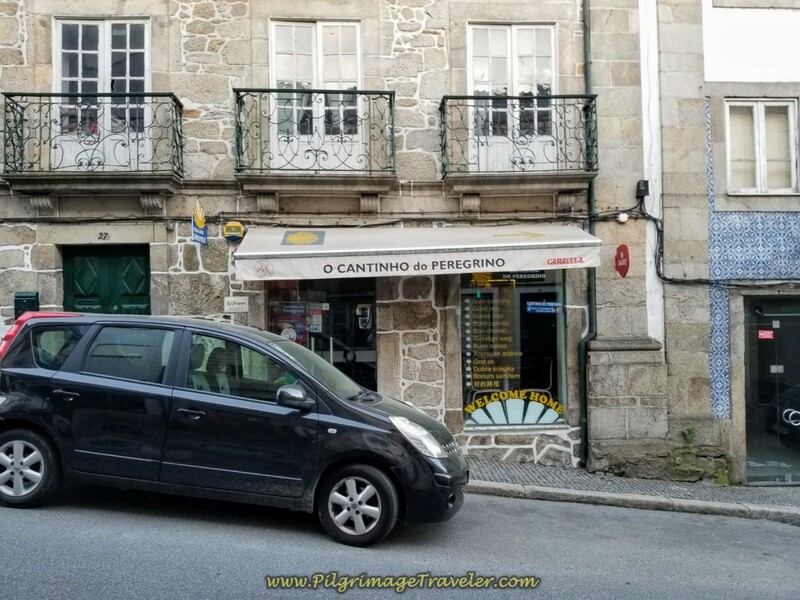 To top off our evening, just across from the albergue was this restaurant, the O Cantinho do Peregrino. The owner is very obliging to cook an early dinner for starving peregrinos, for 10 Euros, including a beverage (wine of course)! 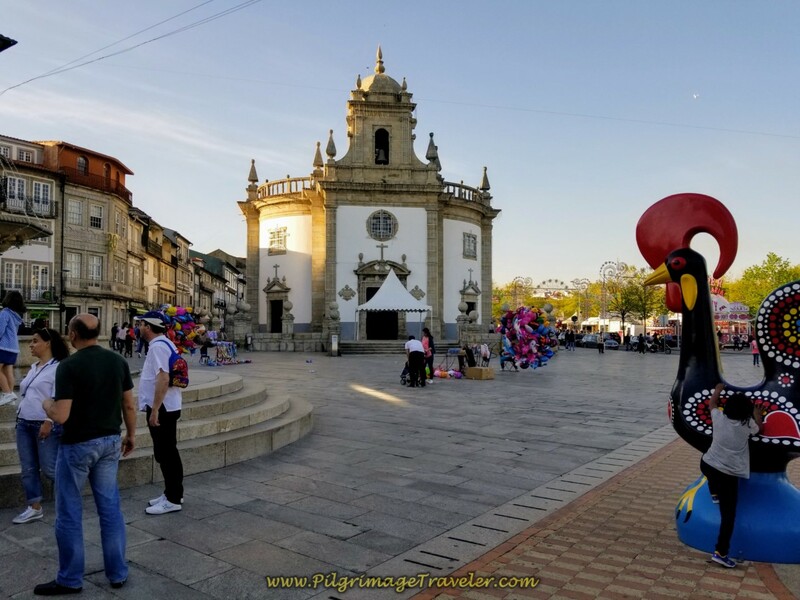 We were able to eat an early enough dinner that we could then tour the town of Barcelos in the evening before sunset. 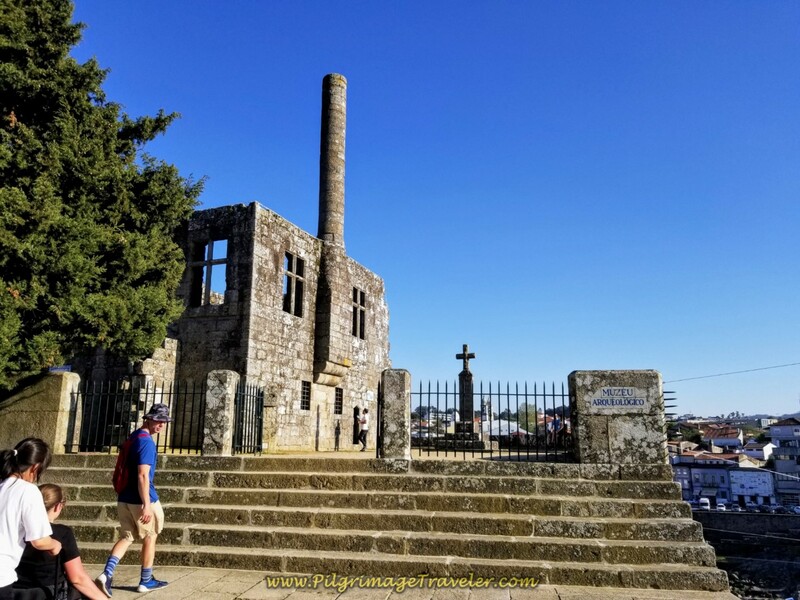 Here are just a few of the many sights that you can see in this lovely town! 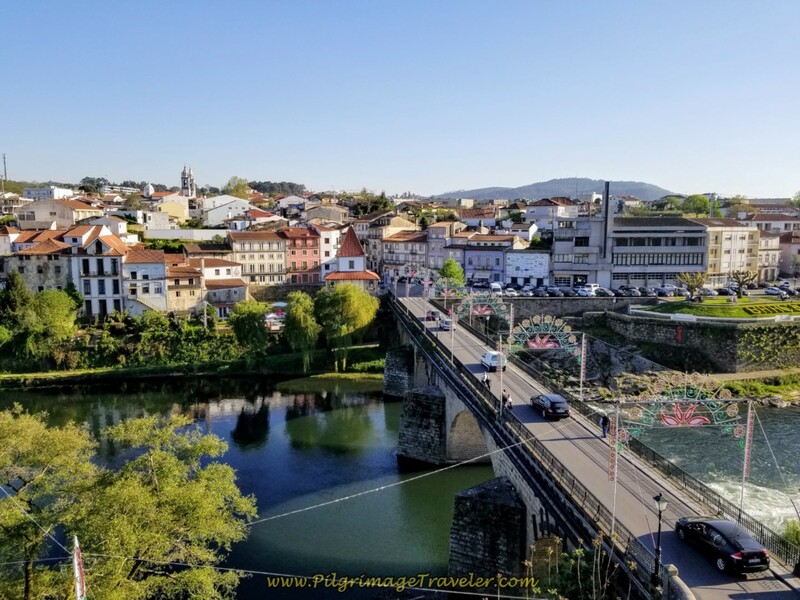 Day seventeen's Camino crosses the bridge and up the street toward the church in the center of town. Here is Magnus pushing Magdalena up the hill. 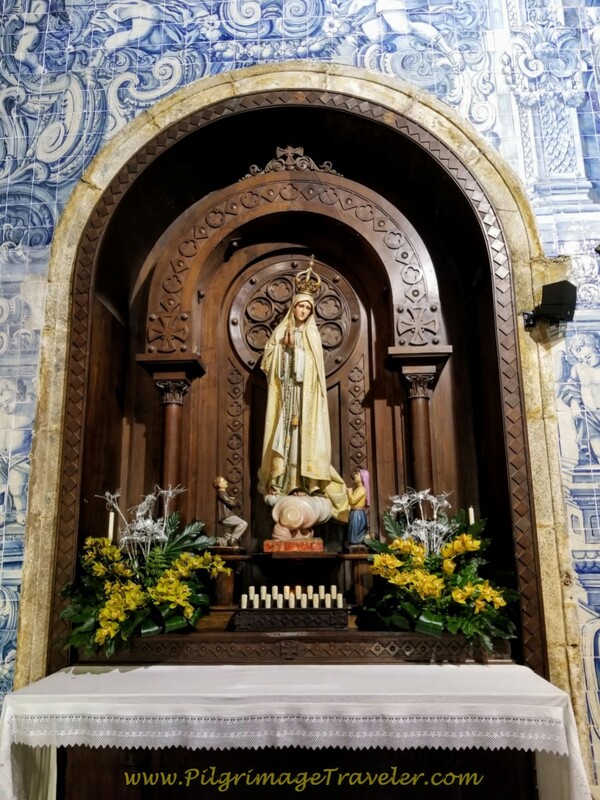 The altar to Fátima in the Igreja Matriz de Barcelos is quite lovely and engaging. You can see the shepherd children at her feet. The church is open all days from 10:00 - 12:00 and 15:00 - 19:30. 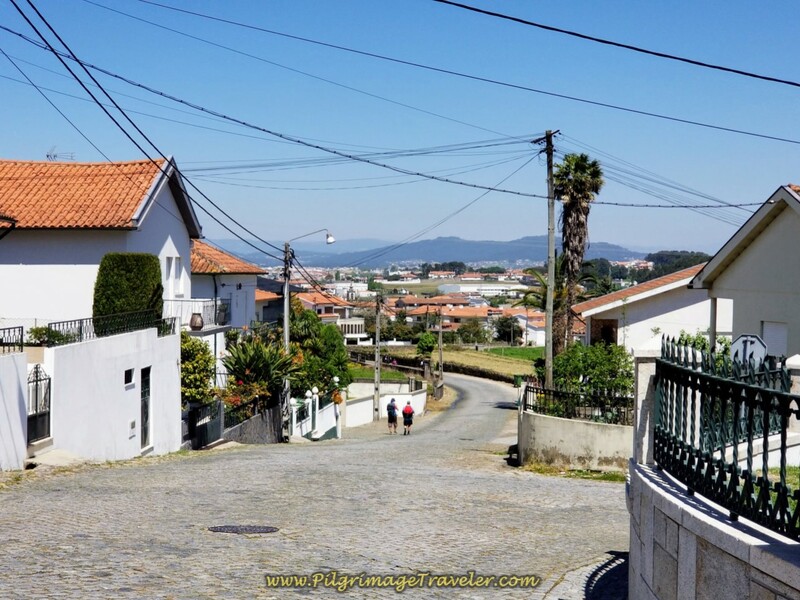 In the first photo below, we are approaching the famous palace in Barcelos that overlooks the river on top of the hill. The palace is in ruins, but it is worth seeing just for the views, in the next two photos. Here is the famous Cruzeiro do Senhor do Galo, or the Cross of the Lord of the Rooster. 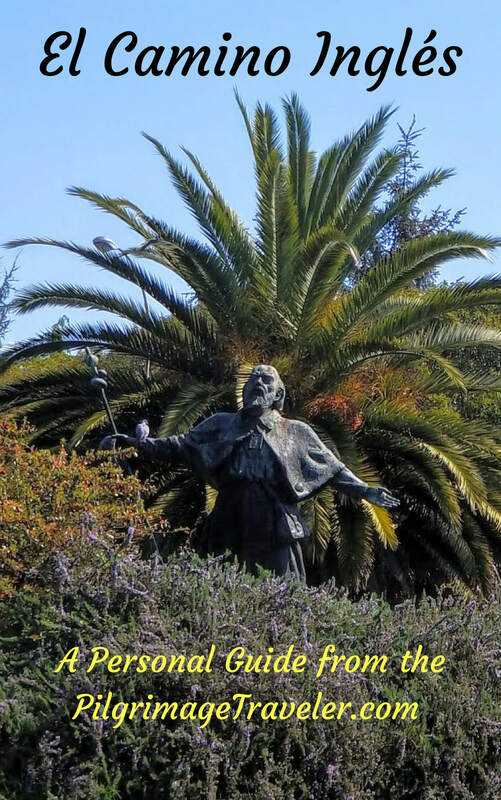 Click here to read the legend of this famous tale of Divine intervention by St James. 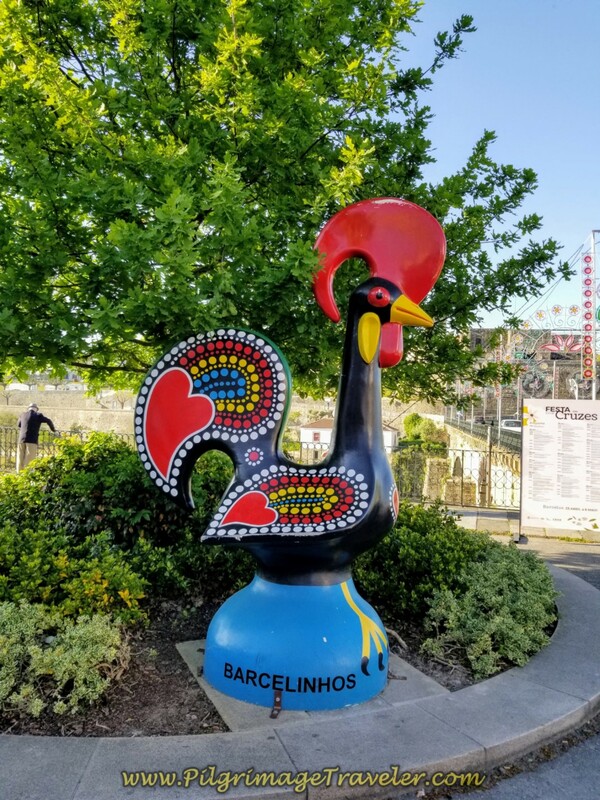 Because of this legend, the rooster is the symbol of this town, and you will see him all over! Look closely at the cross below, left and you will see St. James holding up the hanging man by the feet. The legend is a fascinating one! Be sure to read about it. 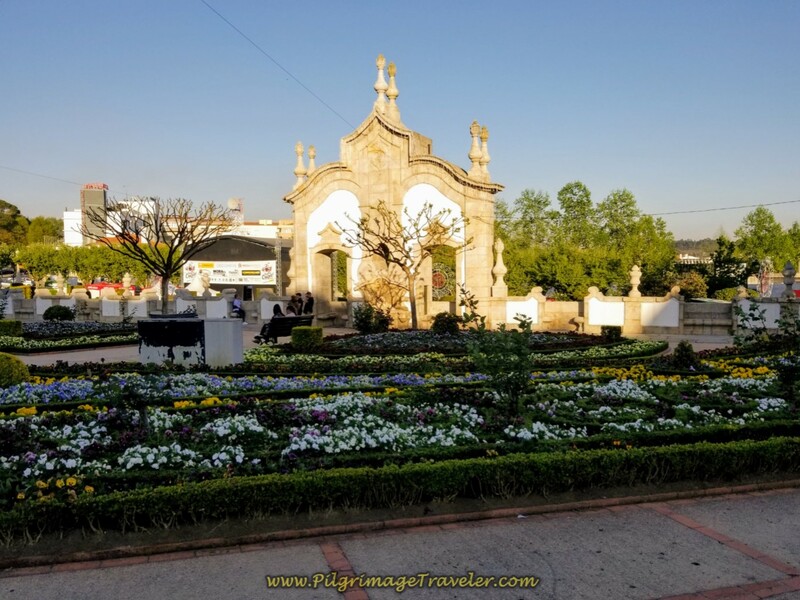 And finally, on the north side of town, is the octagon-shaped Church of the Lord Bom Jesus da Cruz, and the lovely gardens below. Yes, it was a successful day as our Camino family continued to grow. 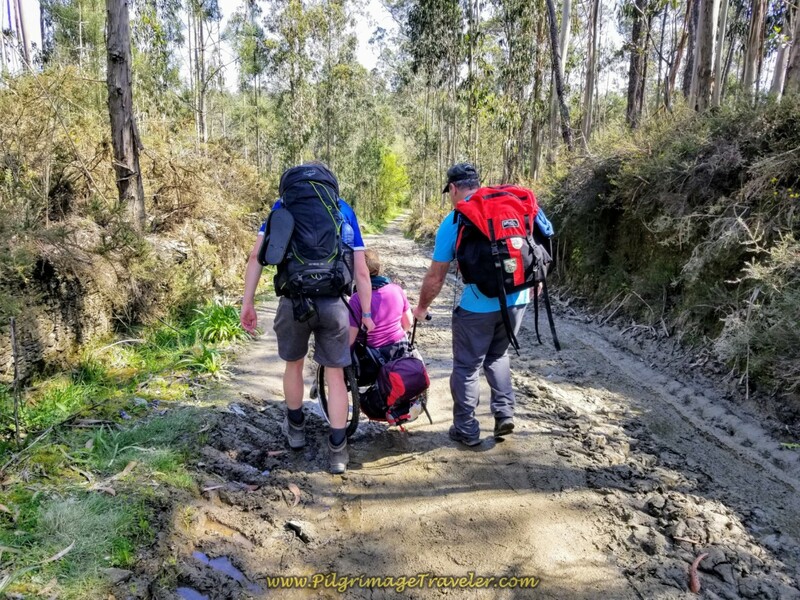 Without the strength of the many men who came to aid us, we would not have been able to accomplish what we did, getting Magdalena 29 kilometers through mud, ruts and uphill cobblestone. Magdalena was determined to push her own wheelchair as much as possible, and I could see she was having a difficult time accepting help. She is such a fabulously independent and courageous young lady! 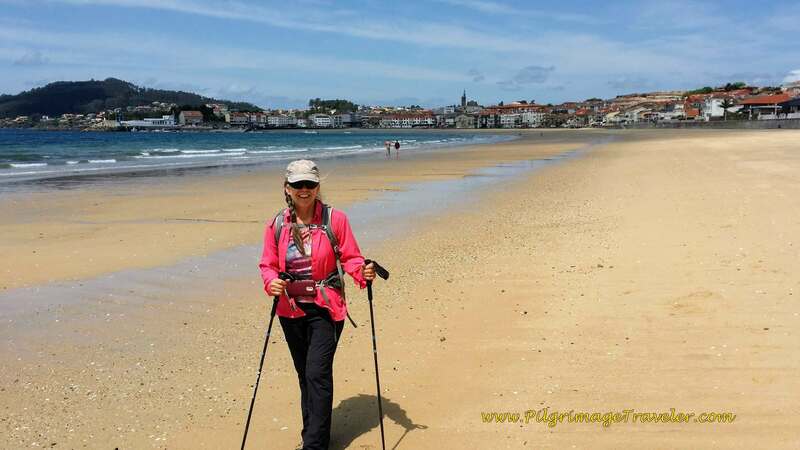 Yet she was full of conflict, because the feelings which came with traveling together in a Camino group was infectious and she wanted to share her journey with us. 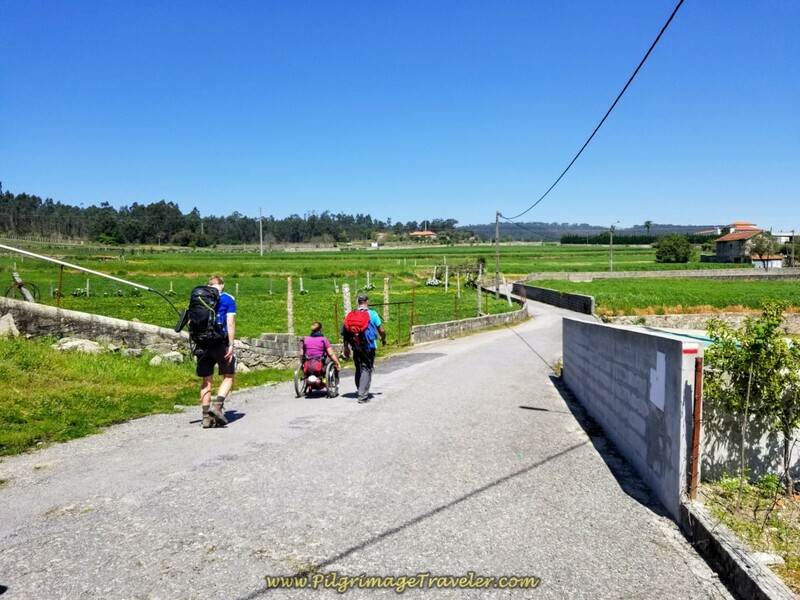 We were all truly having a great time together, laughing and processing each new challenge in the road, and just feeling the amazement regarding Magdalena and how she must be experiencing her Camino! 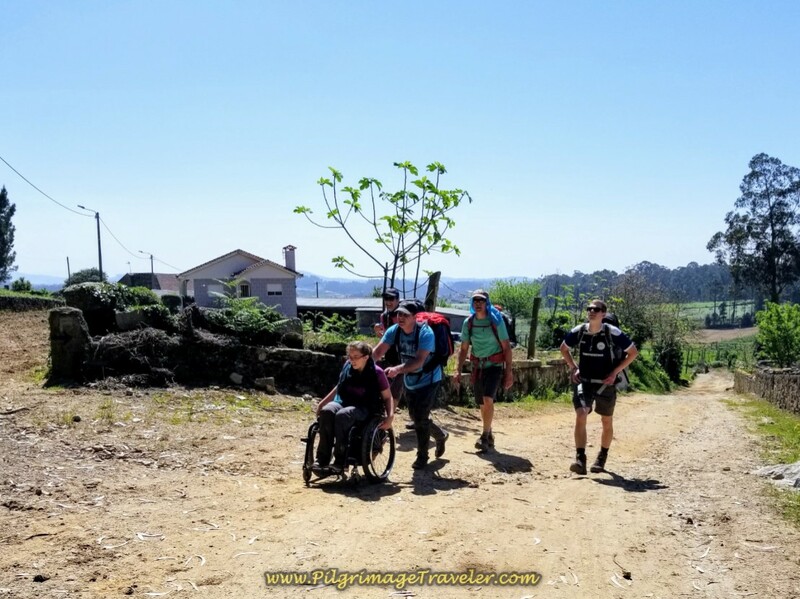 Despite her condition which she has had since a small child, she accomplished so much on day sixteen of her Portuguese Camino on the Central Route. She could still walk a short ways, as she would at times, while the guys carried her wheelchair through sections that were just too difficult to negotiate with her in it. 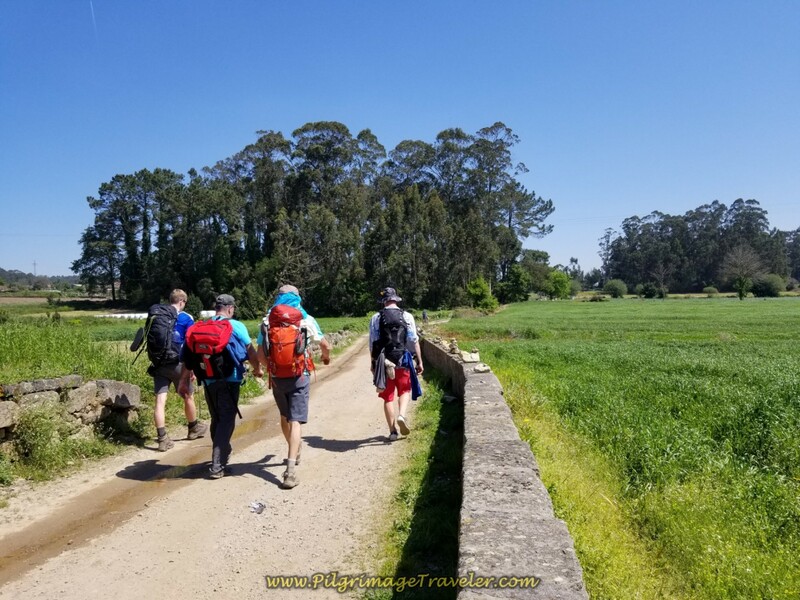 The camaraderie of the shared adventure, shared discoveries and hardships and most importantly, the connectedness, that all occurred despite different backgrounds, politics and religious beliefs were all part of the Camino community spirit that we shared. 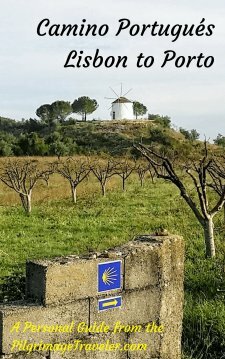 In the days ahead, Magdalena's totally independent spirit would merge with the Camino Spirit of accepting help when needed. It was a new lesson for her, despite her desires. Physically, her hands and legs would be her challenge, as her hands were the appendages to get blisters and her legs would get banged up by her chair as she used her legs as additional brakes. 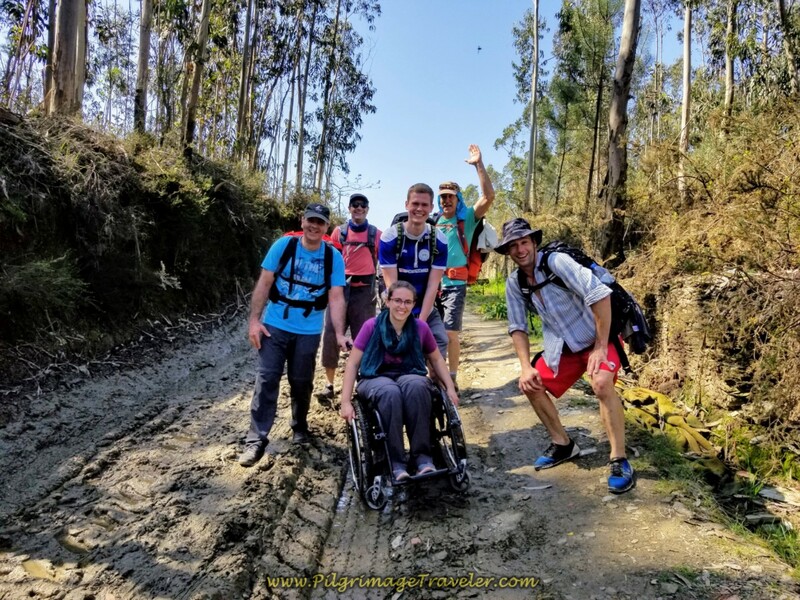 We were blessed to have gathered this group to help us, to help Magdalena and in sharing the difficulties it brought us together faster and stronger than it might have otherwise. 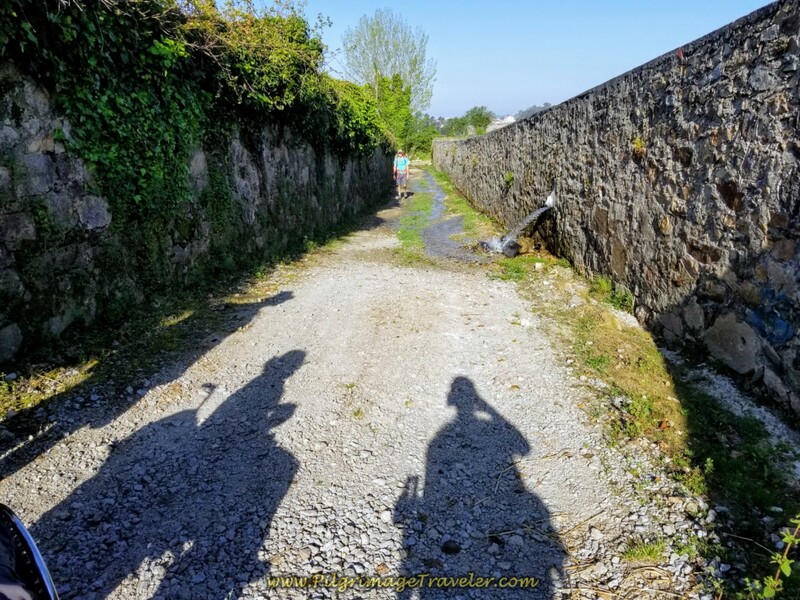 Our shared Circle of Love was a fabulous way to experience our Camino. The pleasure of connecting with these strong, willing and giving young people was a special treat for us indeed! 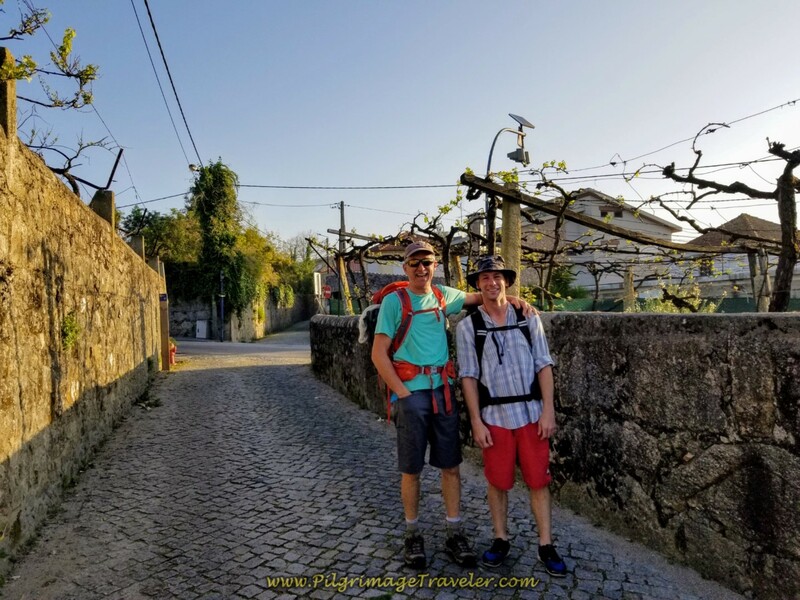 May your own day sixteen on the Central Route of the Portuguese Camino be filled with connectedness, and a mutual helping that completes your Circle of Love! May you be blessed when through helping others, you receive more than you give!